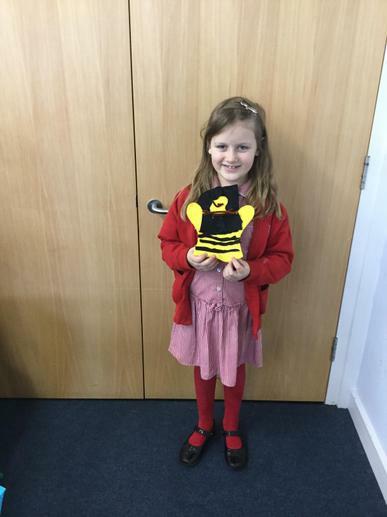 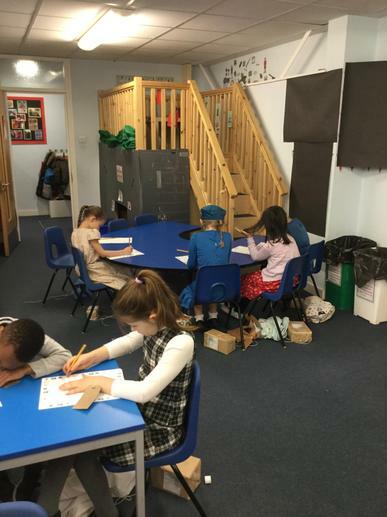 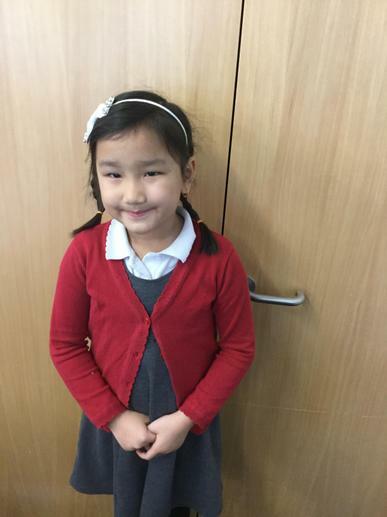 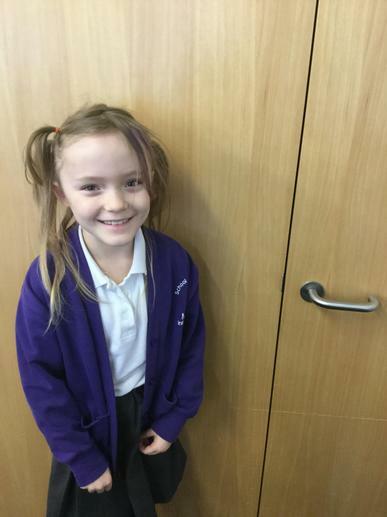 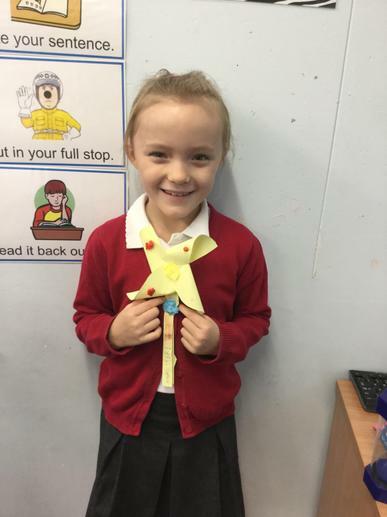 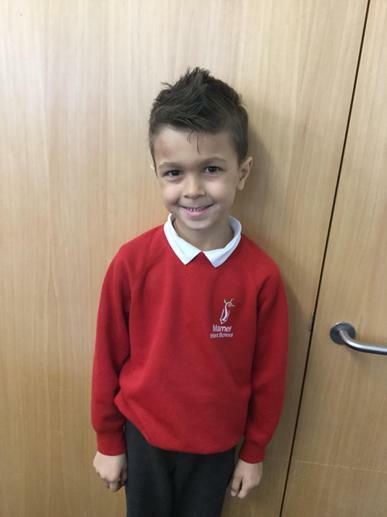 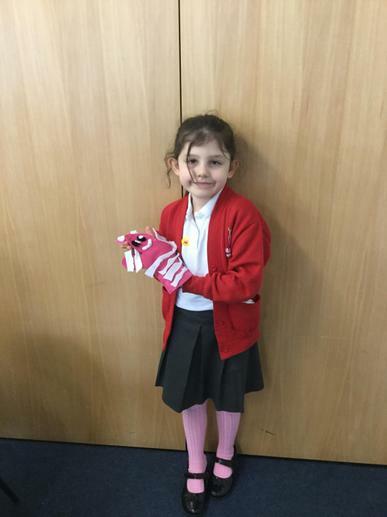 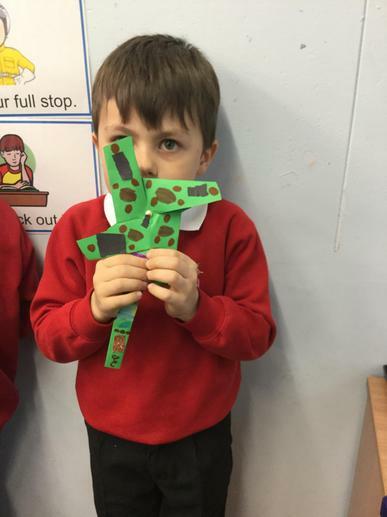 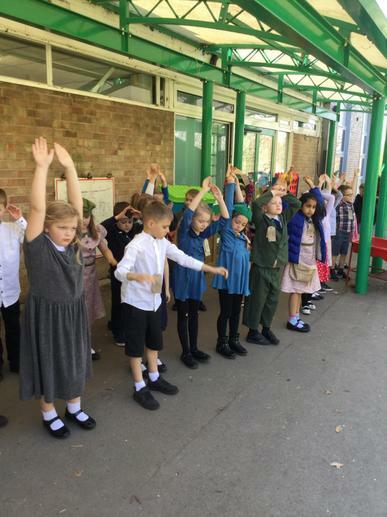 Welcome to Zebra class! 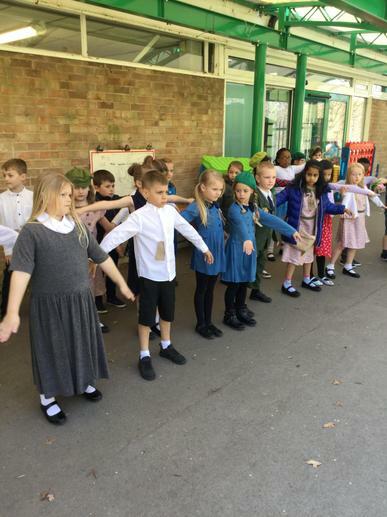 We are very excited to teach your children this year. 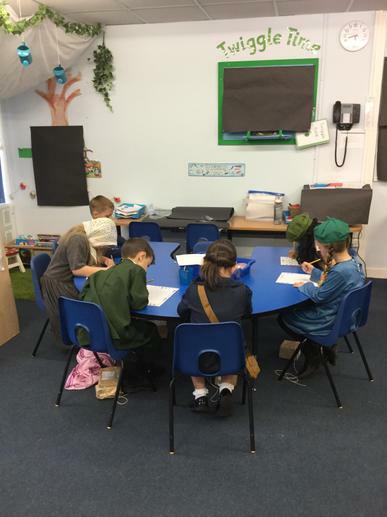 If you have any questions please feel free to write in your child's reading diary or ask the teacher at the end of the school day. 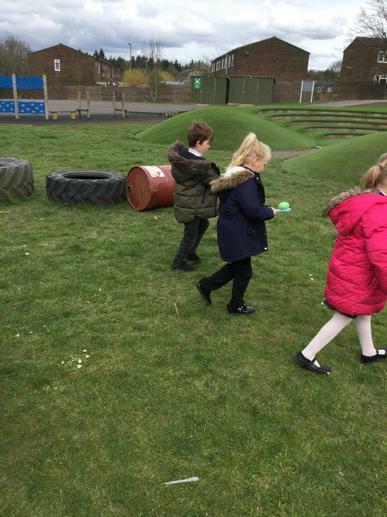 PE is on Fridays. 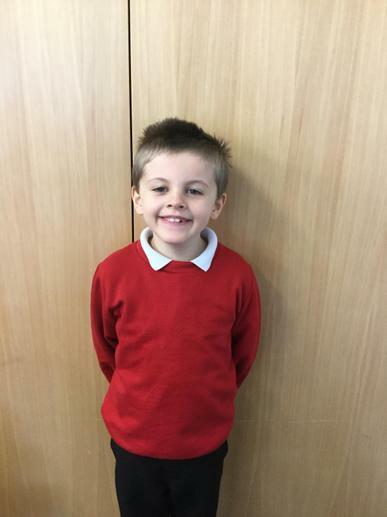 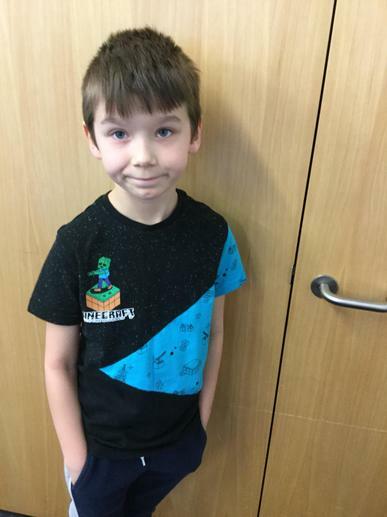 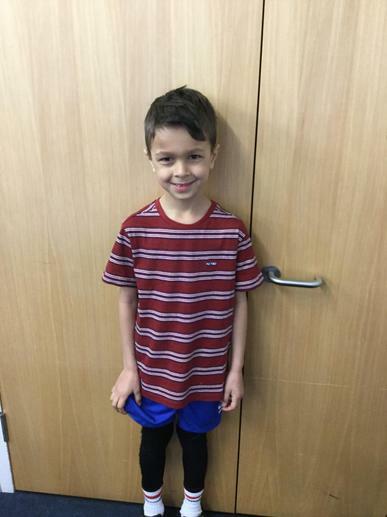 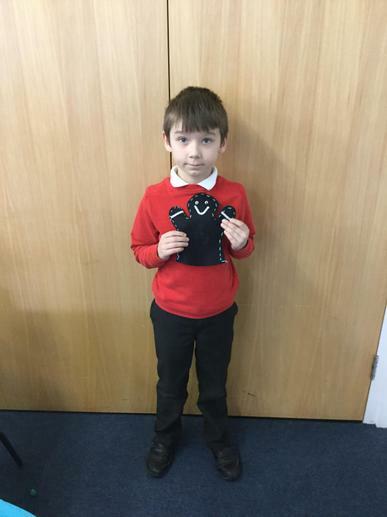 Please make sure your child has a t-shirt, shorts and trainers/plimsolls to wear. 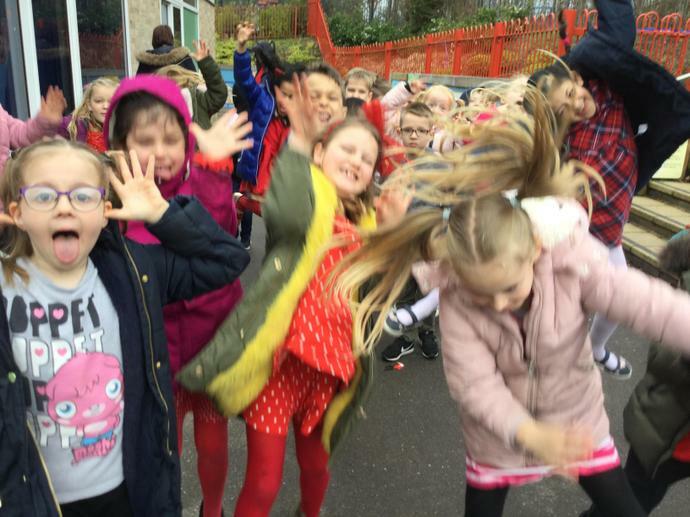 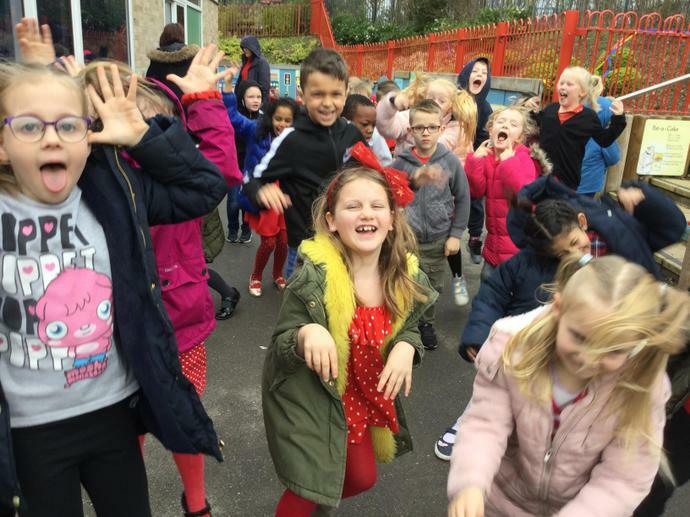 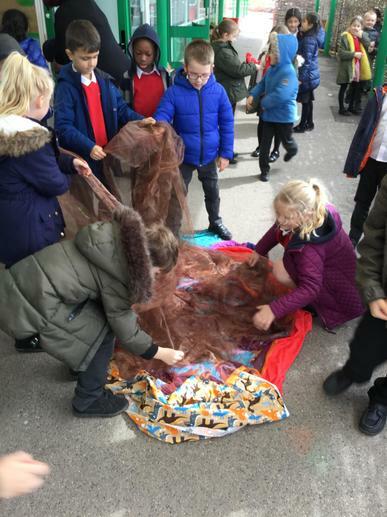 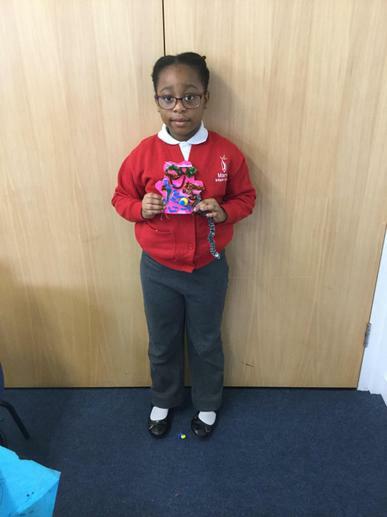 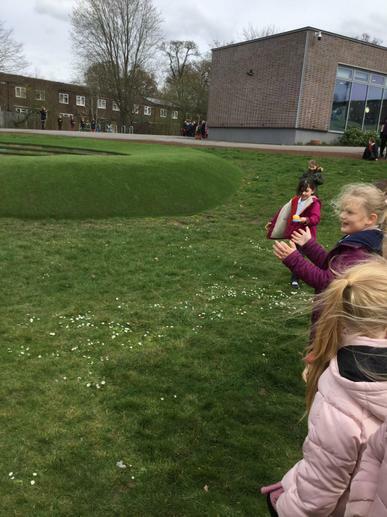 On the last day of term we celebrated Easter, we had loads of fun activities all day. 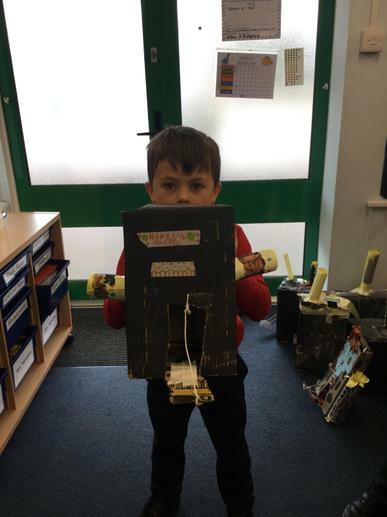 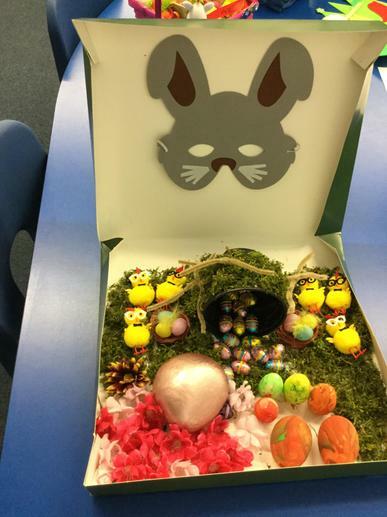 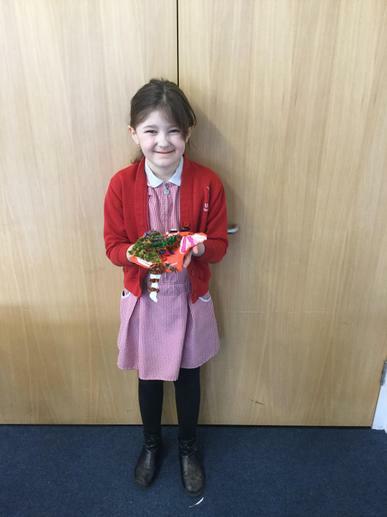 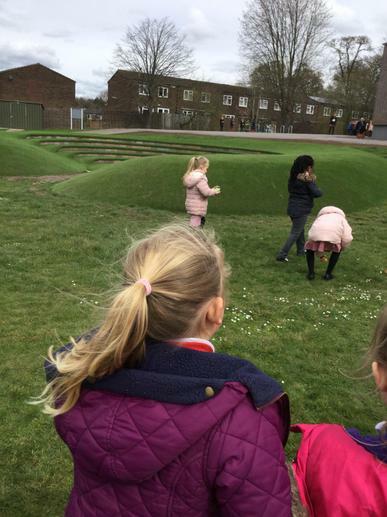 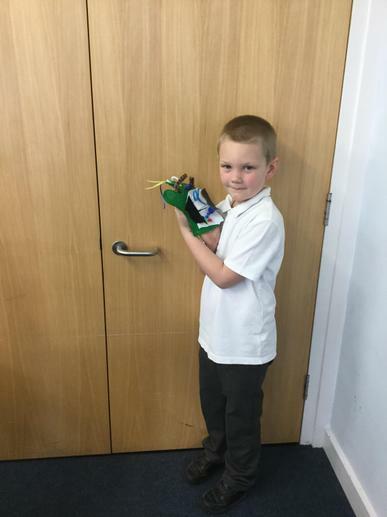 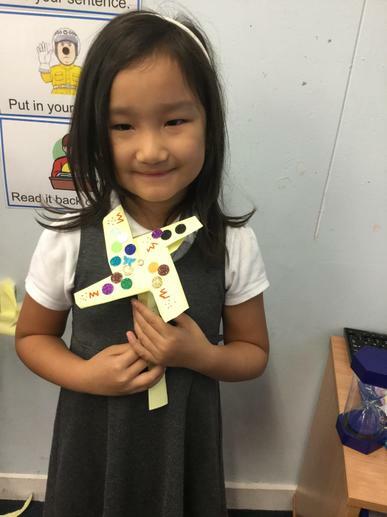 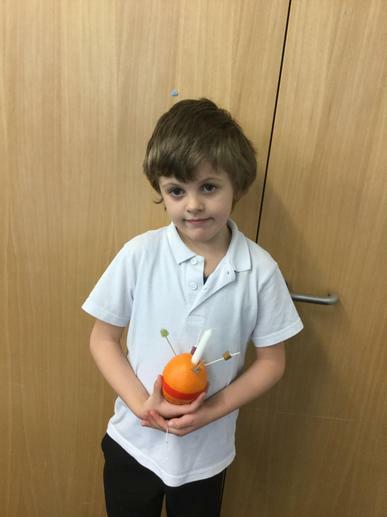 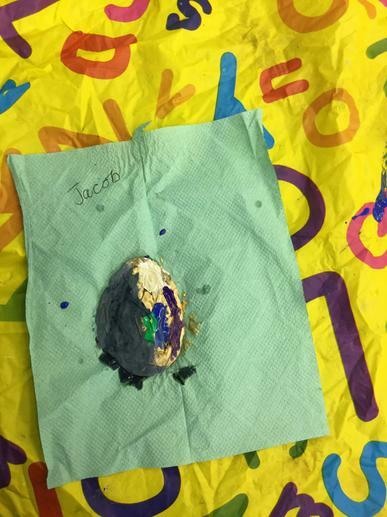 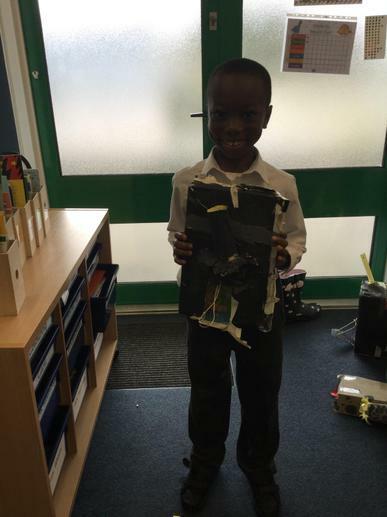 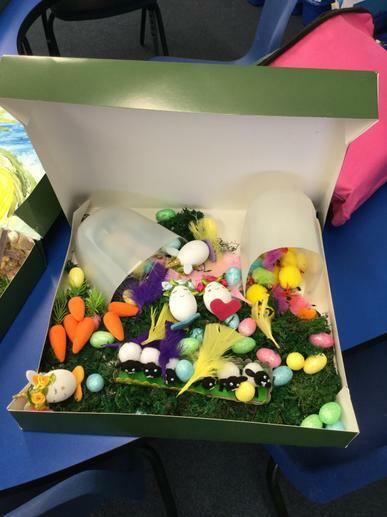 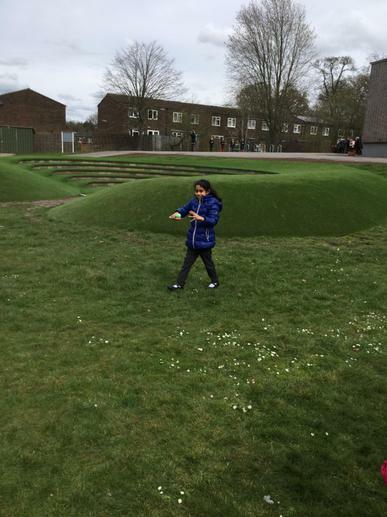 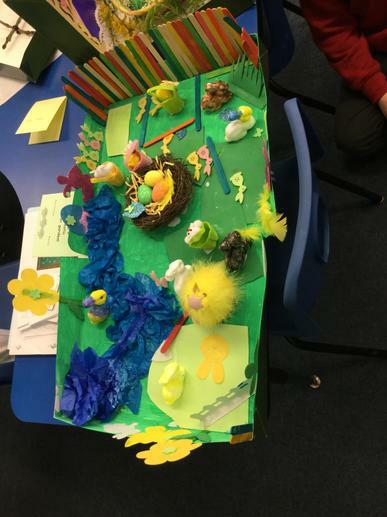 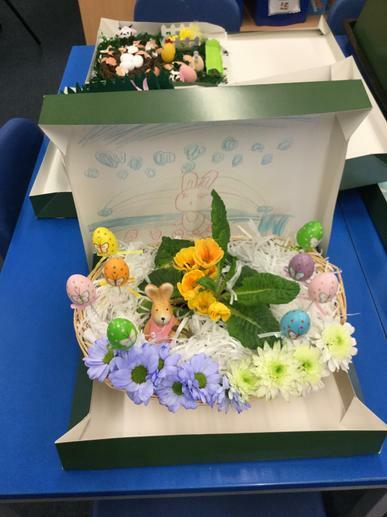 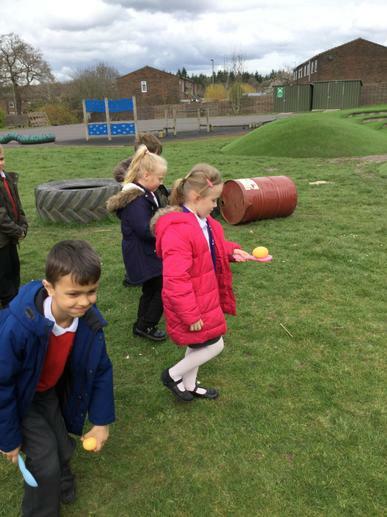 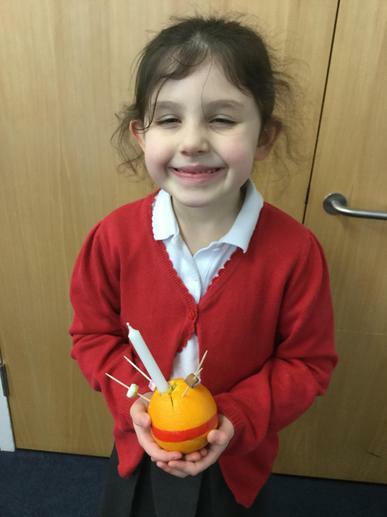 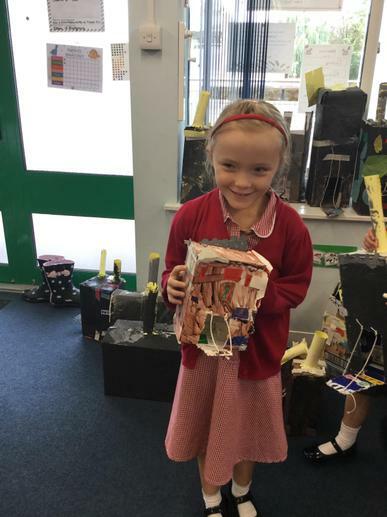 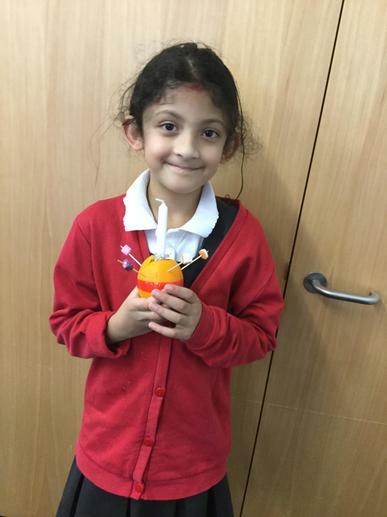 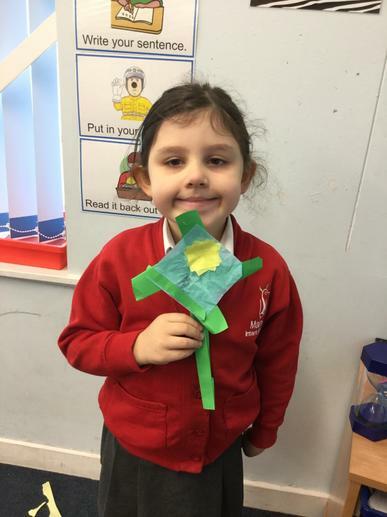 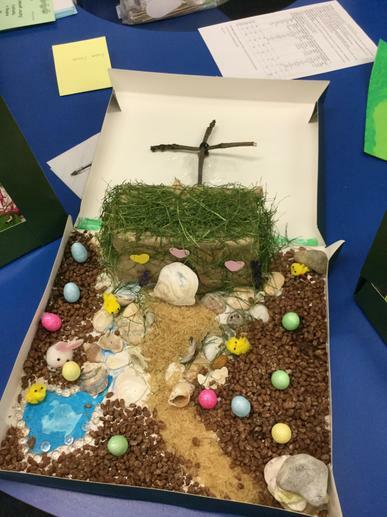 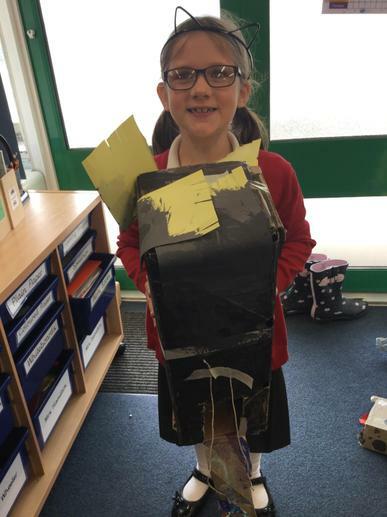 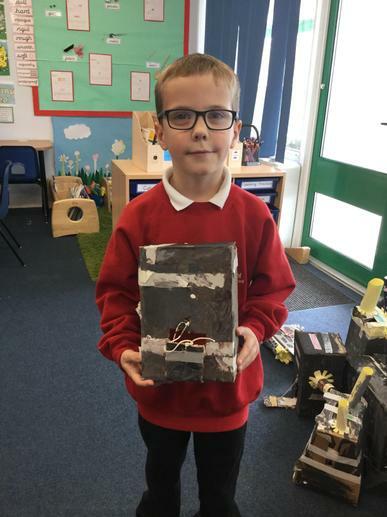 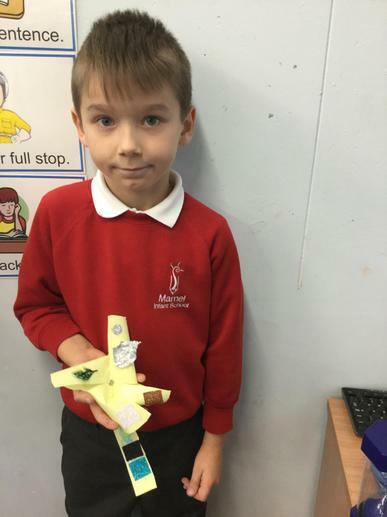 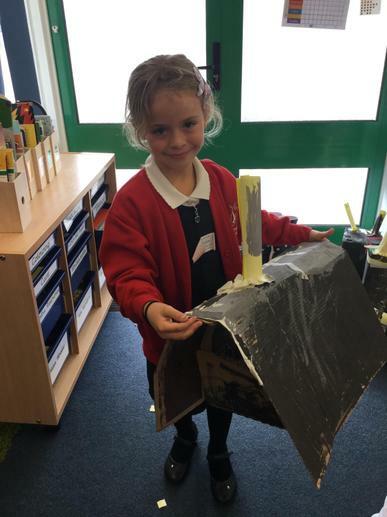 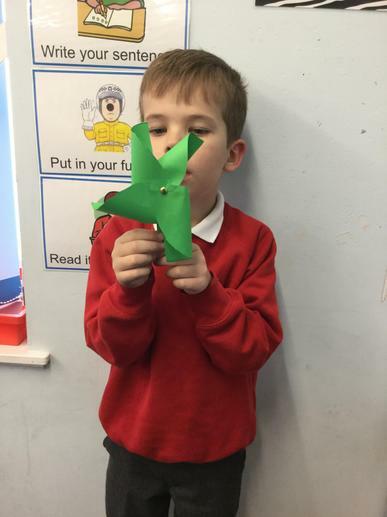 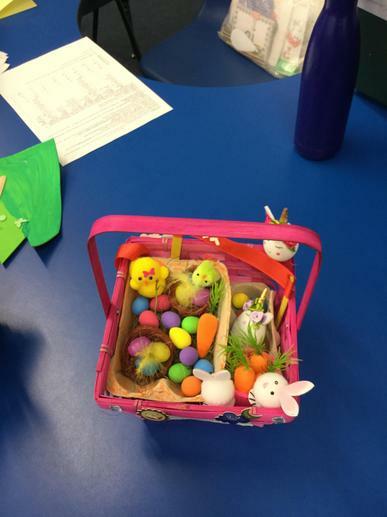 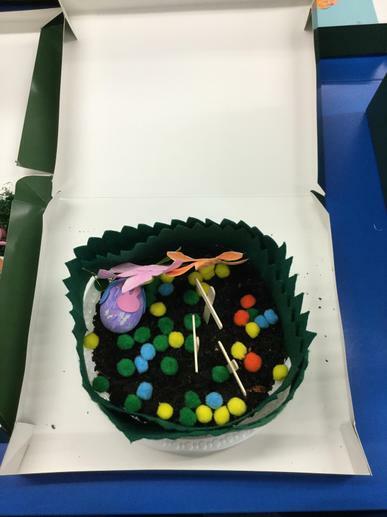 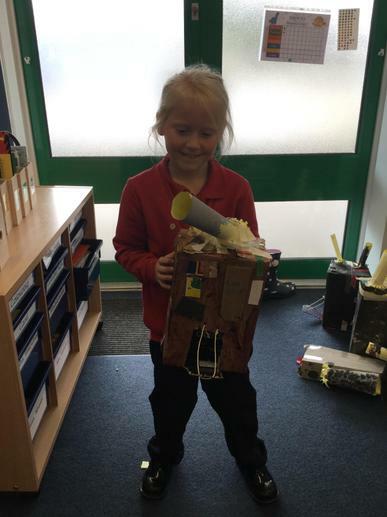 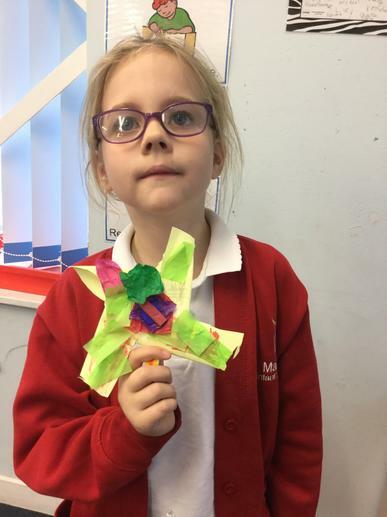 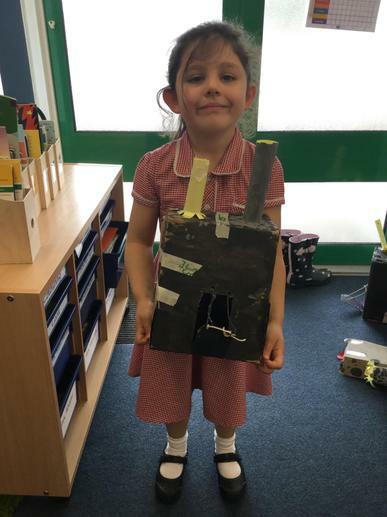 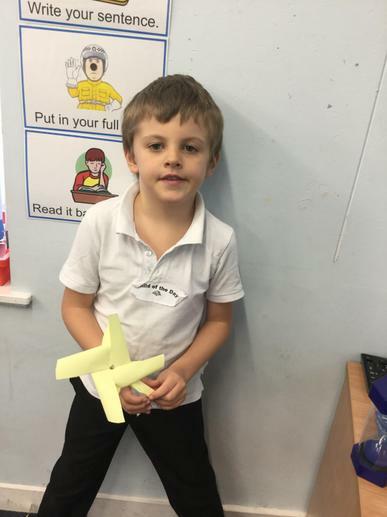 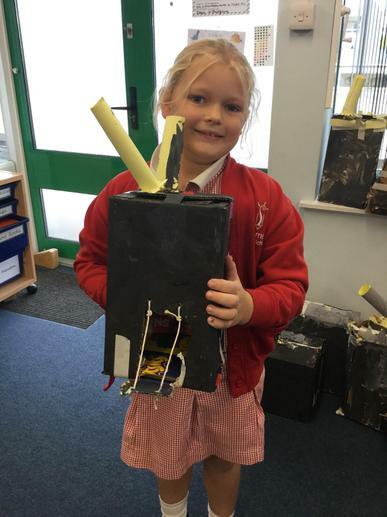 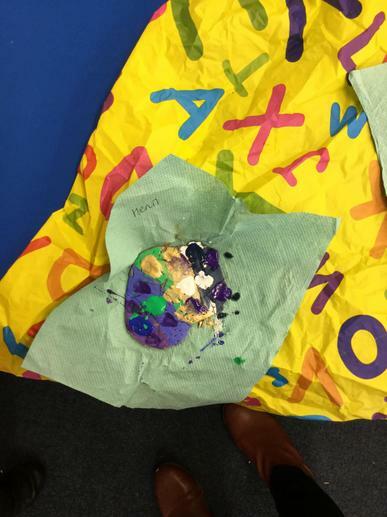 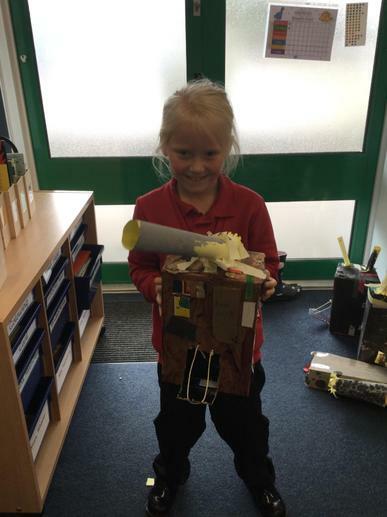 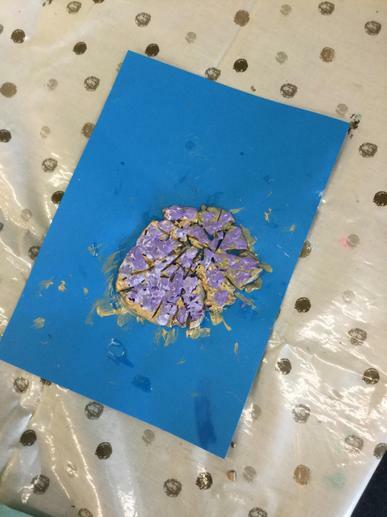 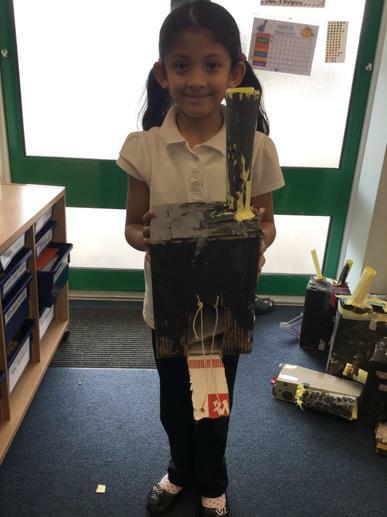 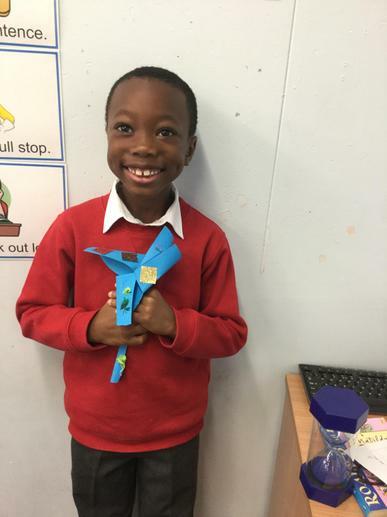 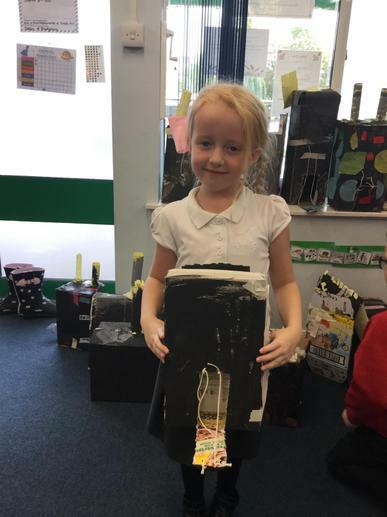 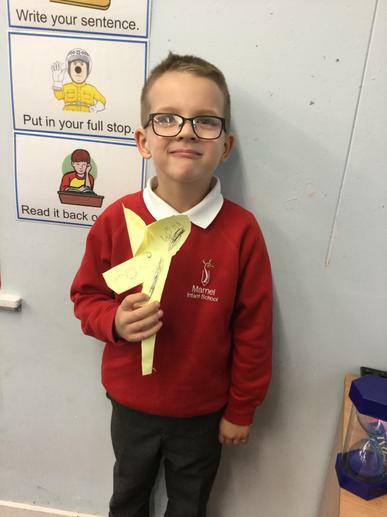 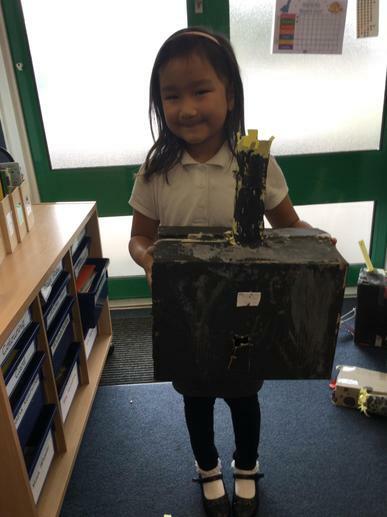 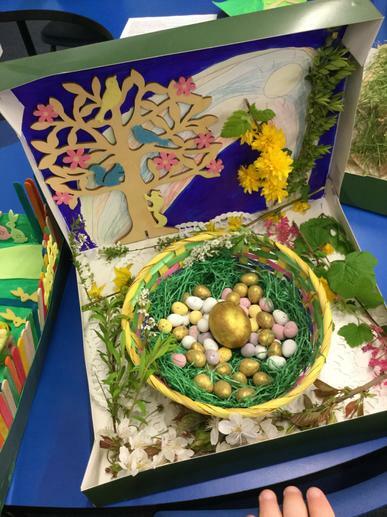 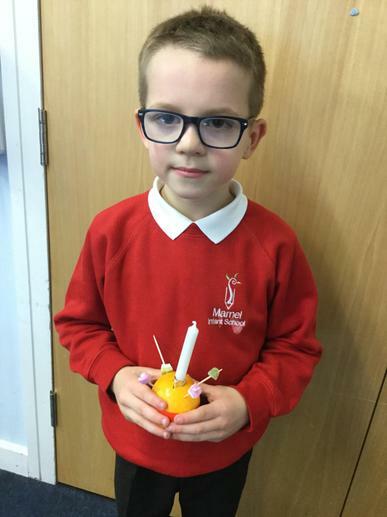 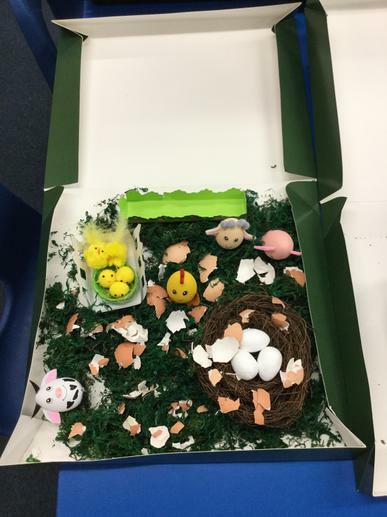 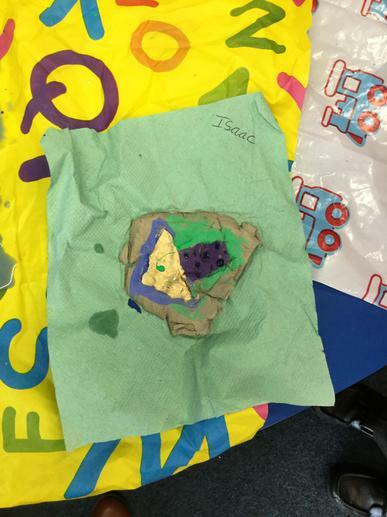 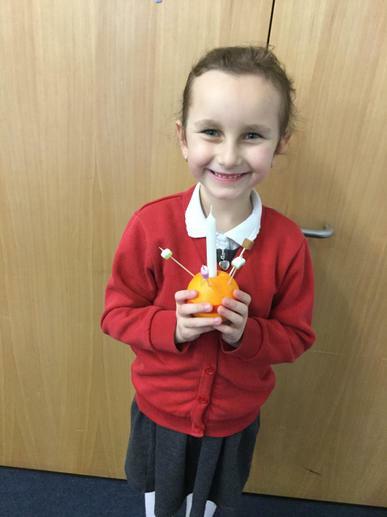 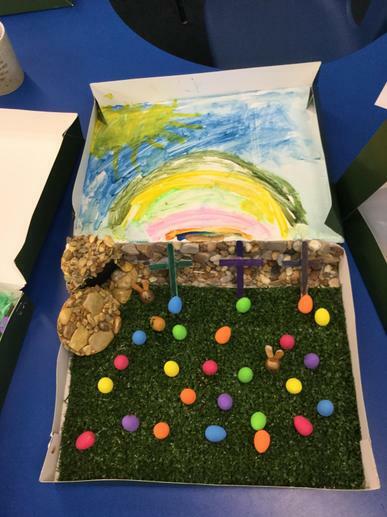 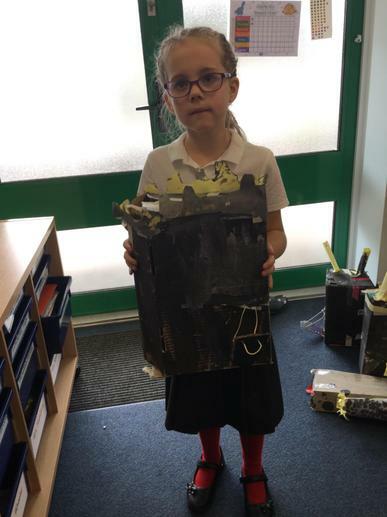 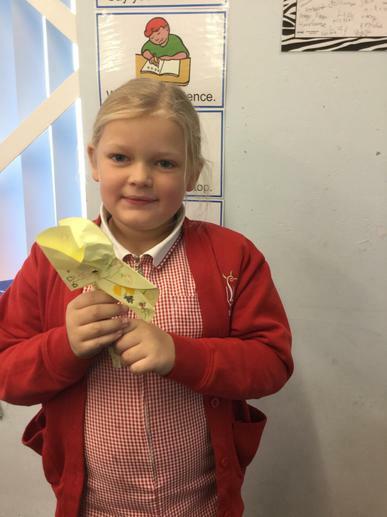 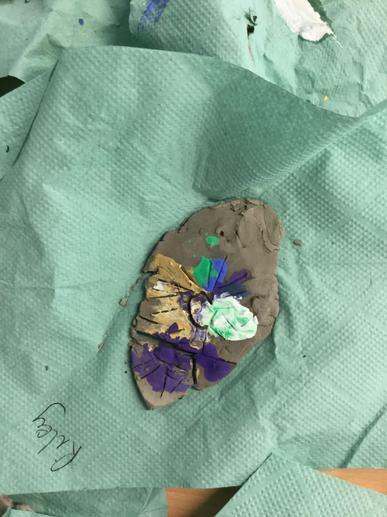 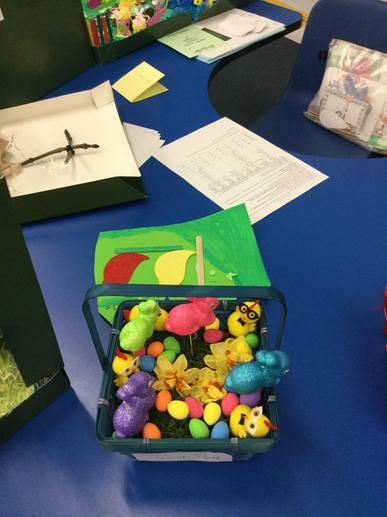 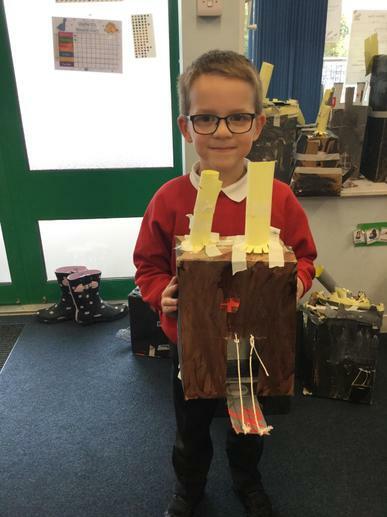 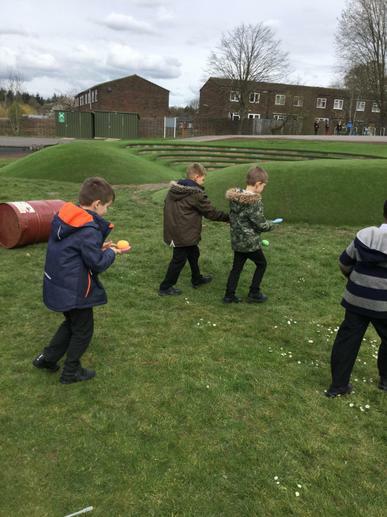 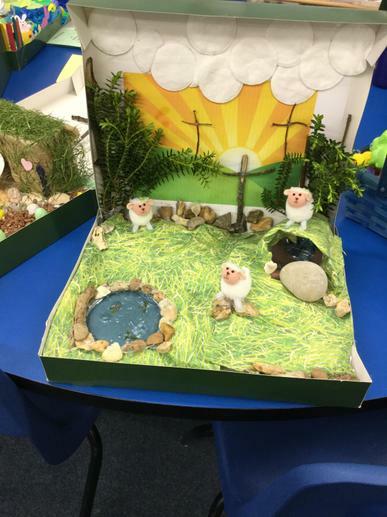 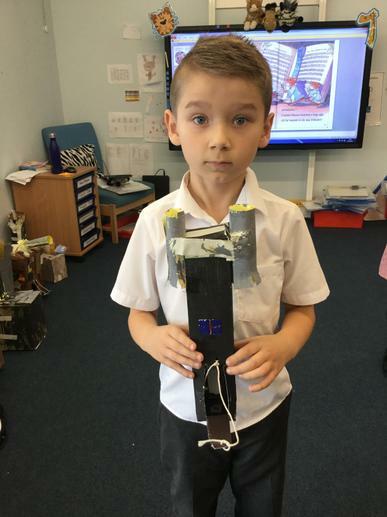 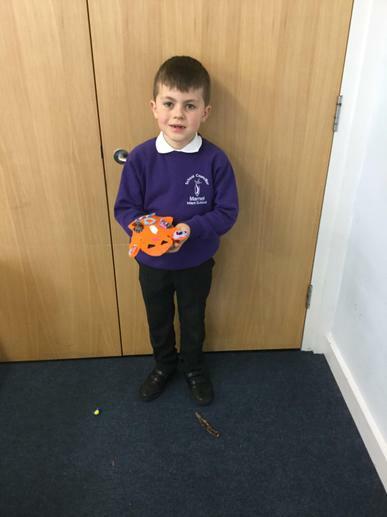 We made our very own Easter gardens, had an egg and spoon race and even made our own egg out of materials. 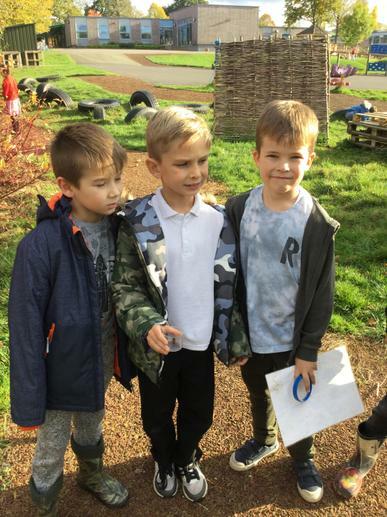 It was an amazing day! 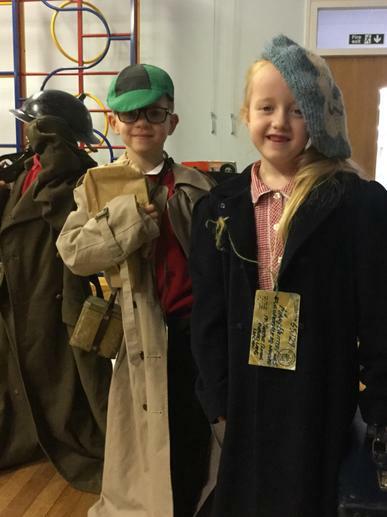 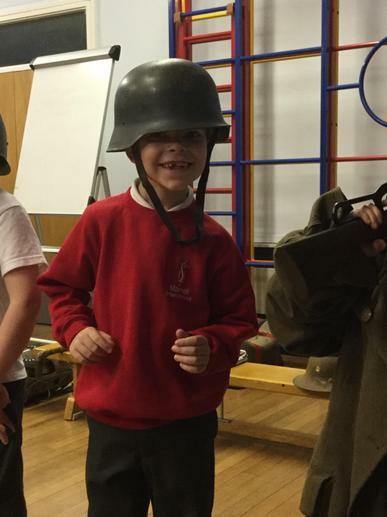 We had a brilliant WW2 day. 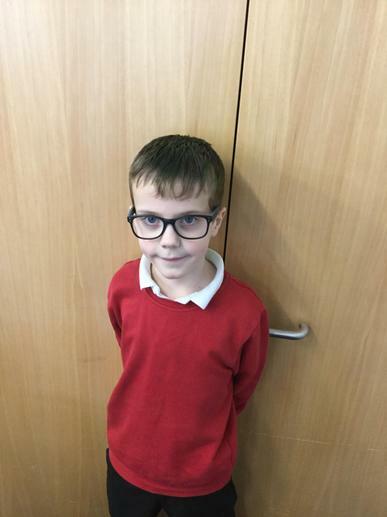 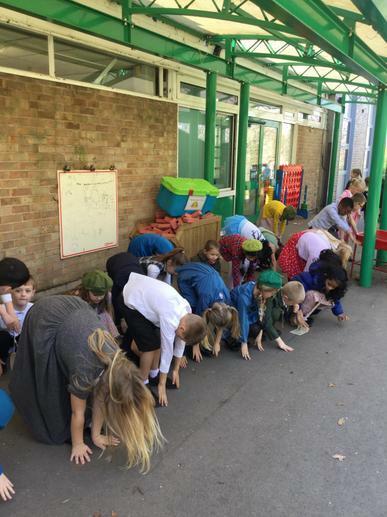 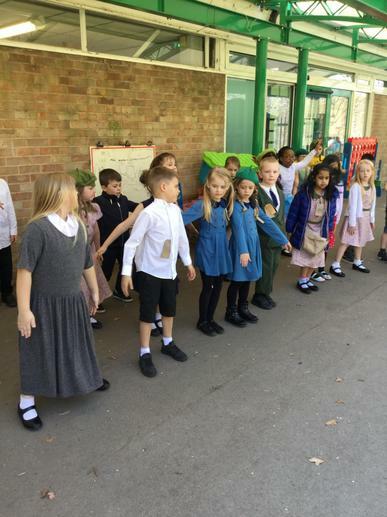 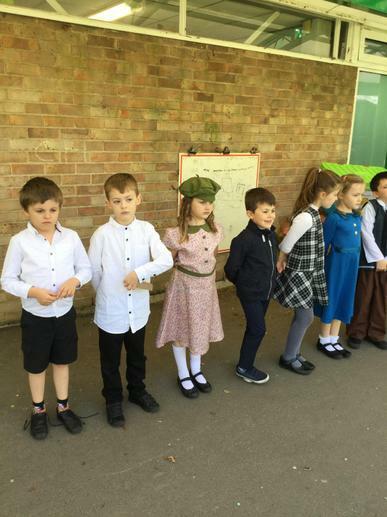 We all came in dressed as evacuees and were evacuated to another class in the school! 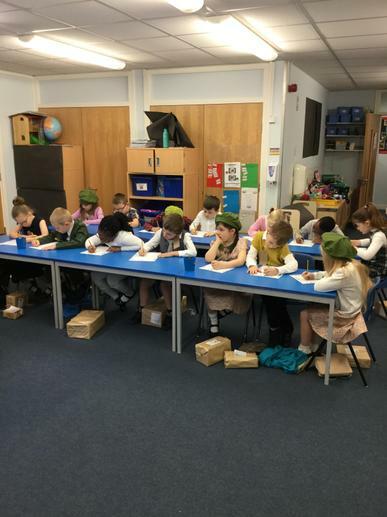 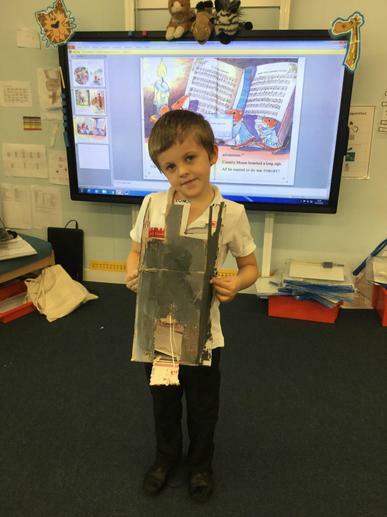 We learnt all about what schools used to be like and did lessons just like they used to. 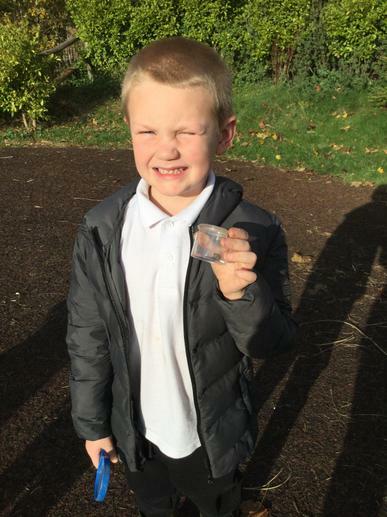 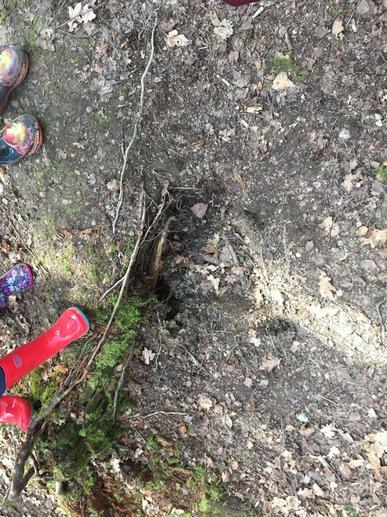 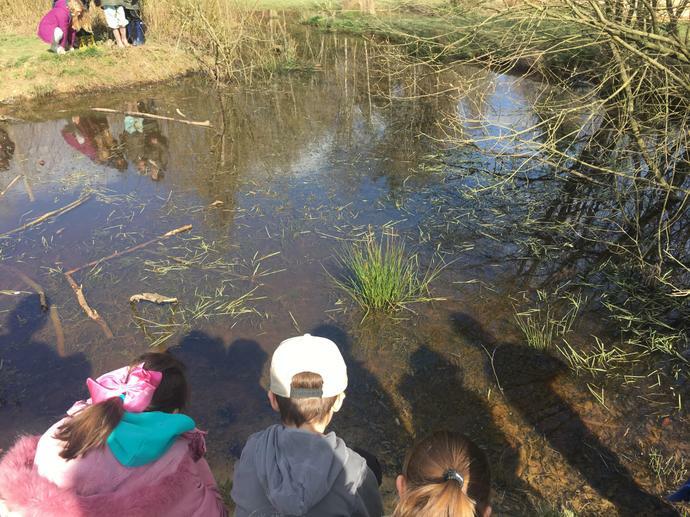 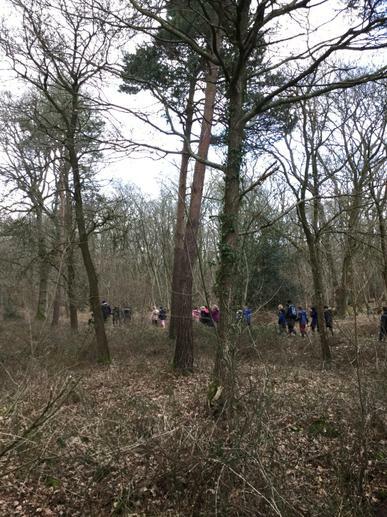 Today we went to the woods hunting for animals habitats, we found a rabbit hole and lots of bird nests. 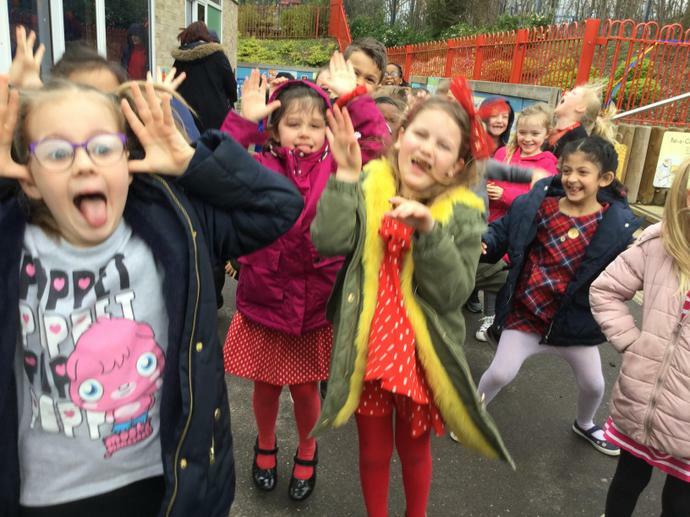 Red Nose Day!! 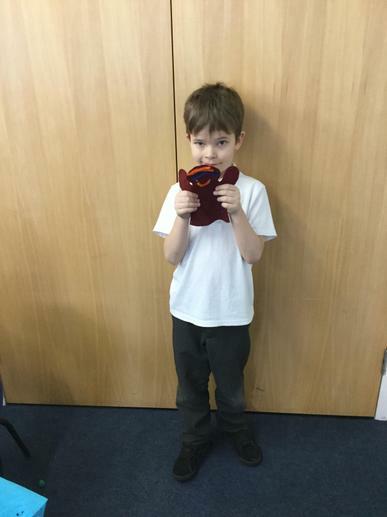 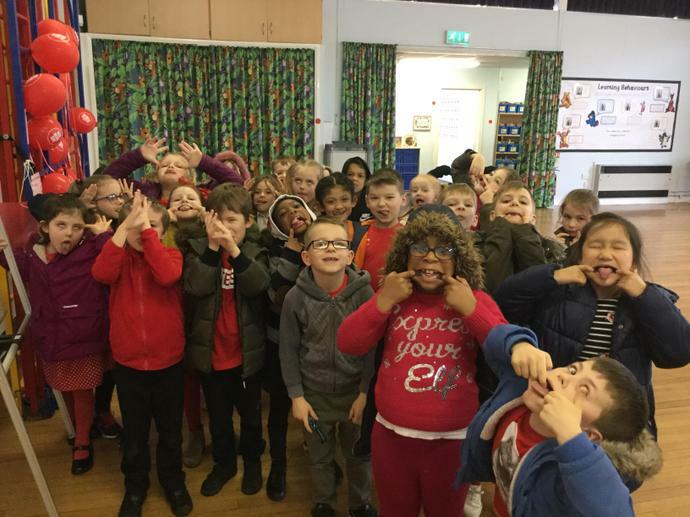 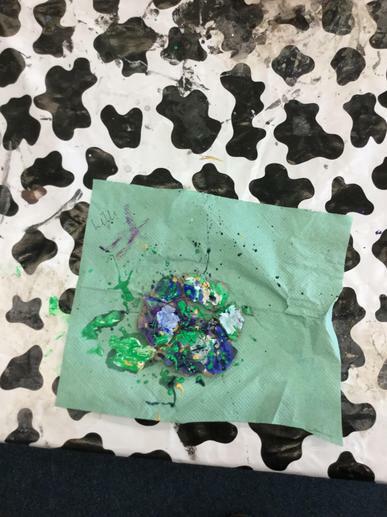 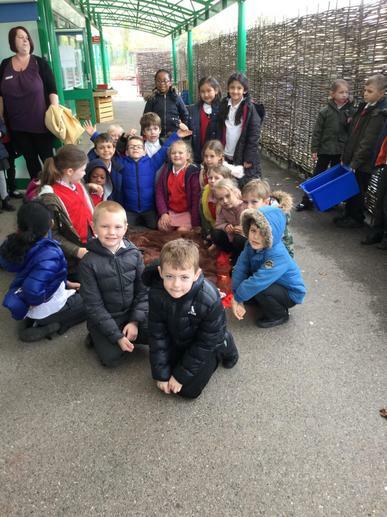 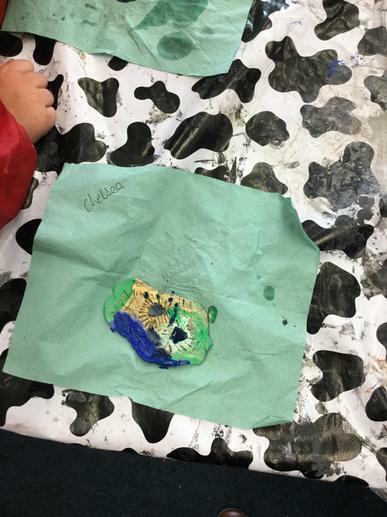 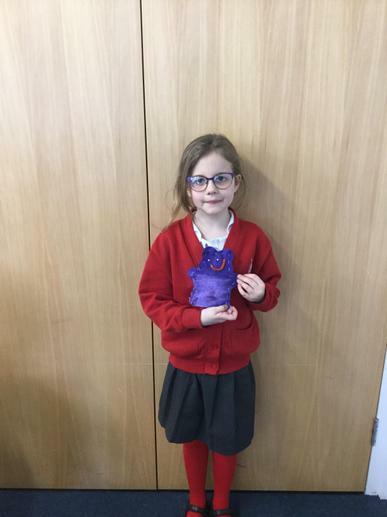 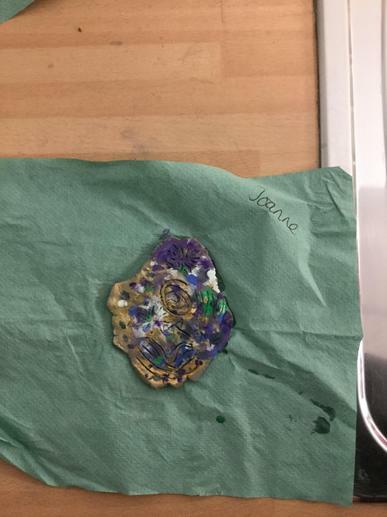 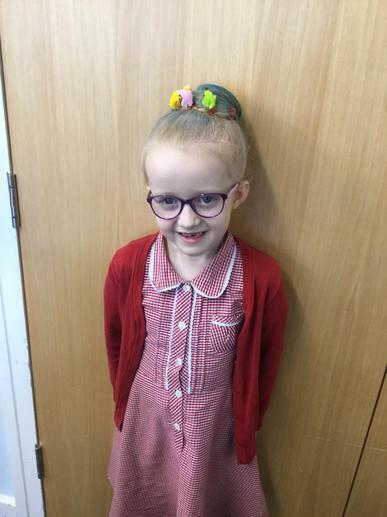 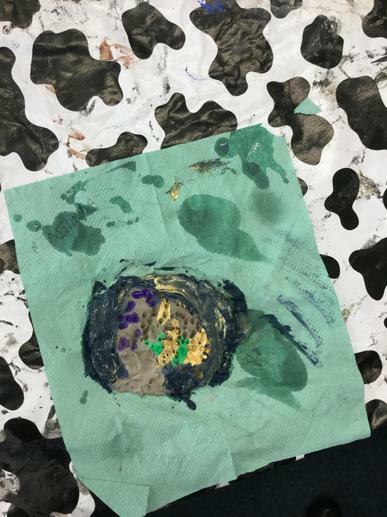 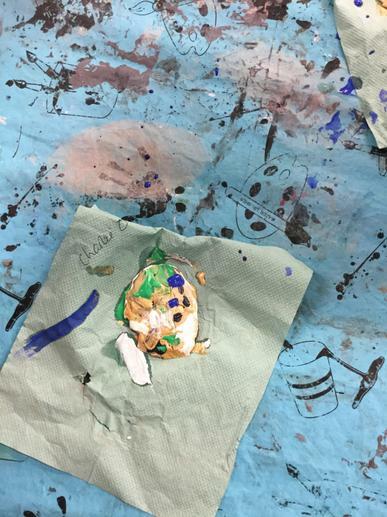 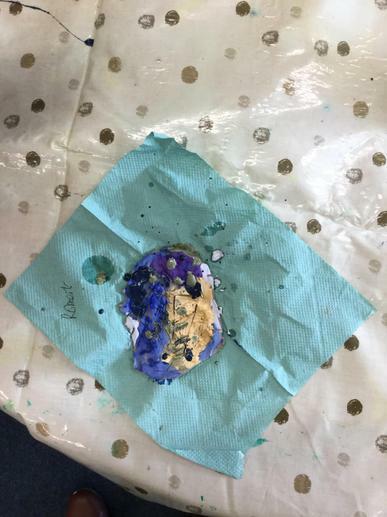 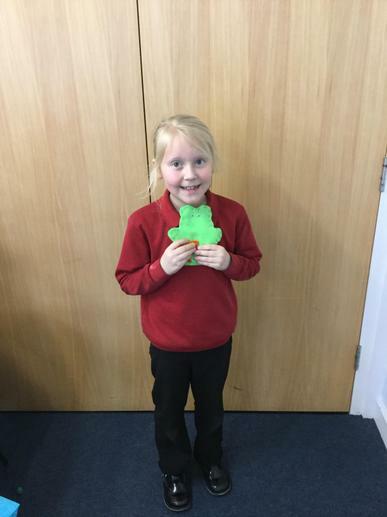 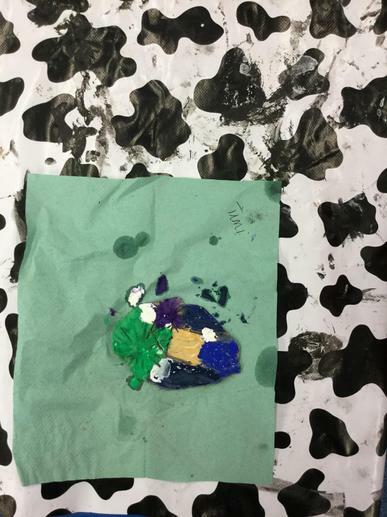 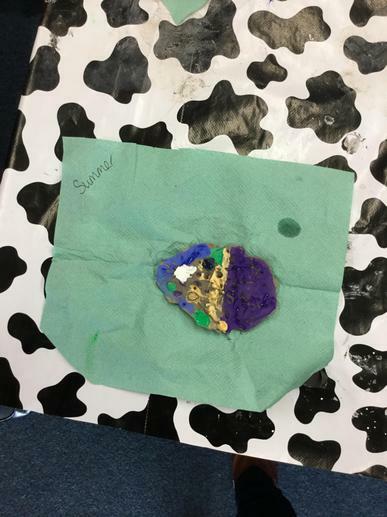 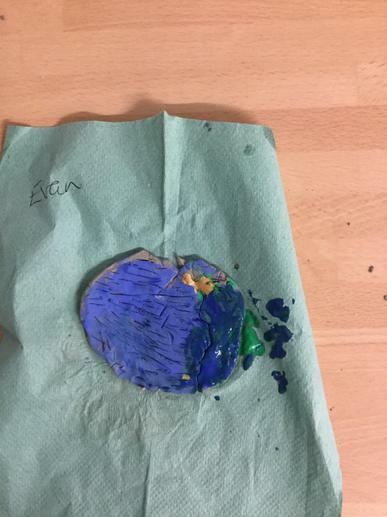 we took part in lots of fun activities throughout today, we decorated biscuits, completed red nose day themed literacy and maths and our favourite of the day was going on a red nose treasure hunt! 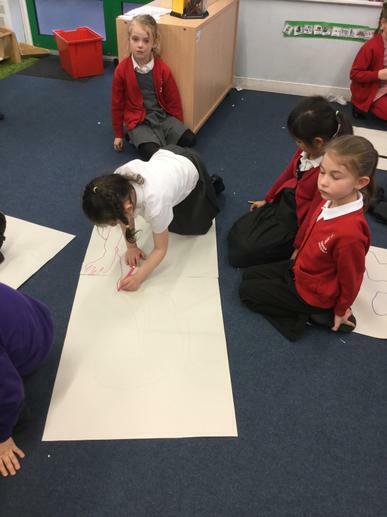 Thrive: We drew around each other and wrote as many compliments as we could about one another. 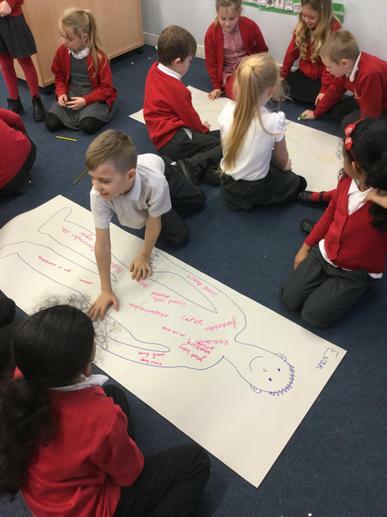 We talked about how happy we feel when people are nice to us as well as how happy it makes us feel being kind to others. 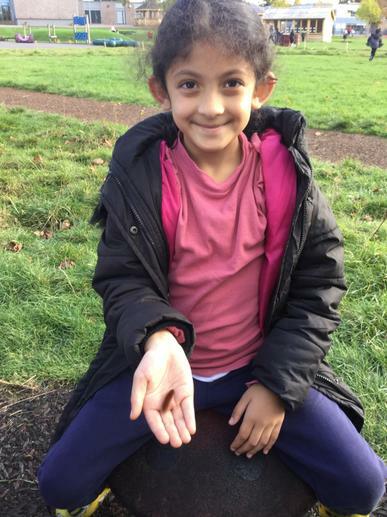 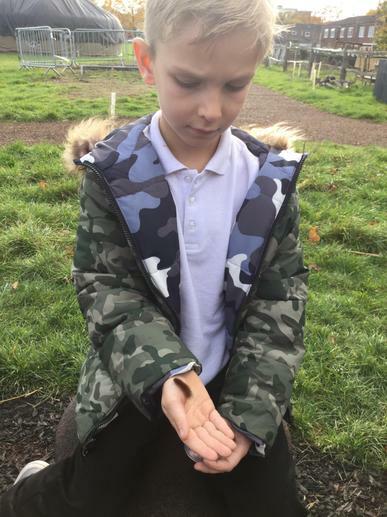 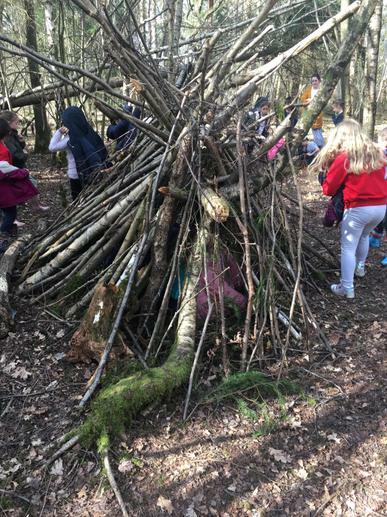 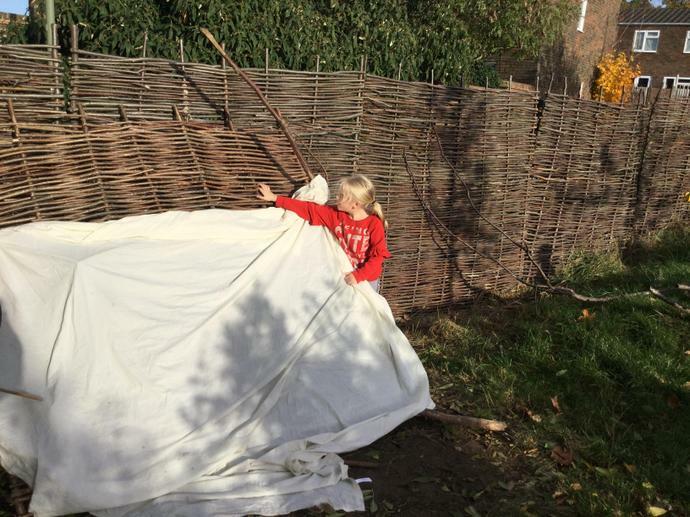 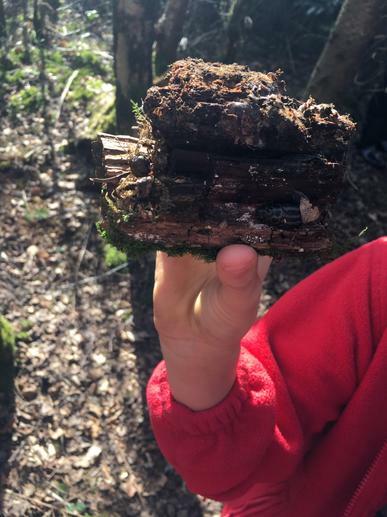 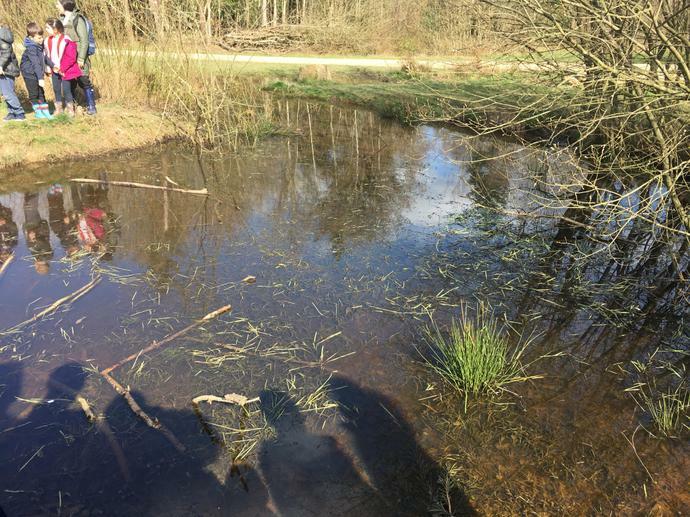 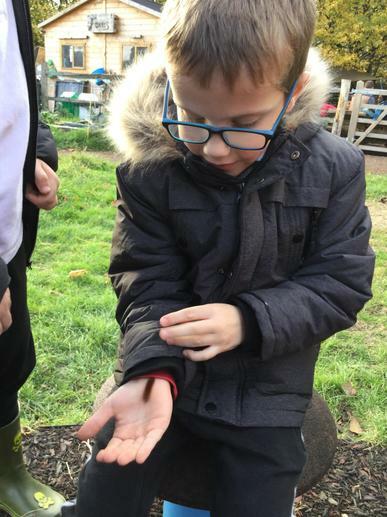 Forest school- We all loved building dens and we even found a buttercup to include in our rabbits habitat! 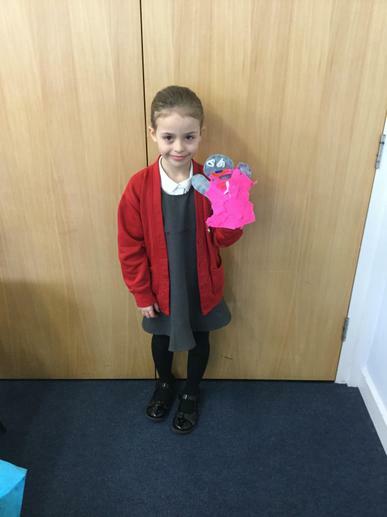 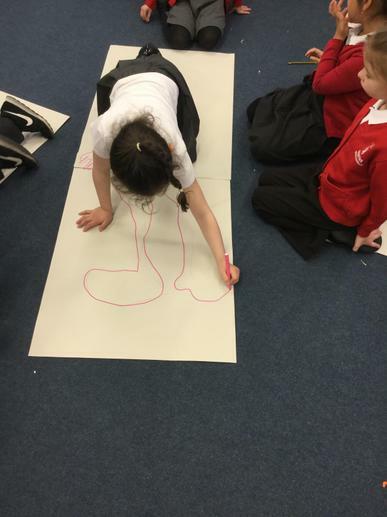 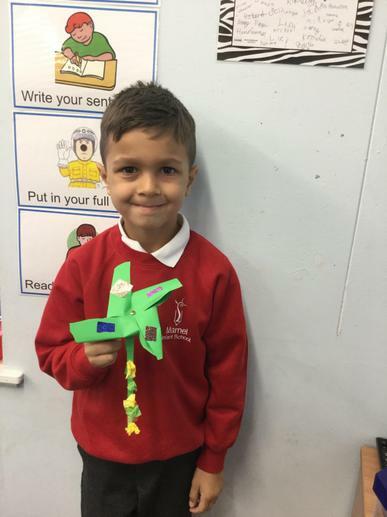 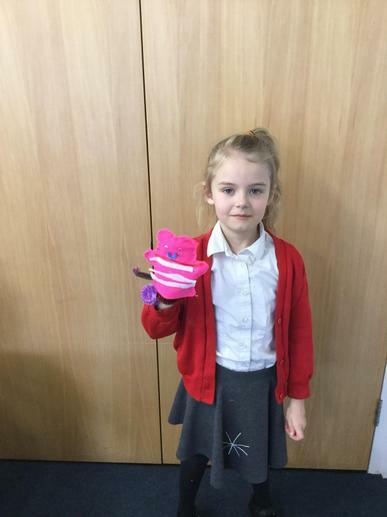 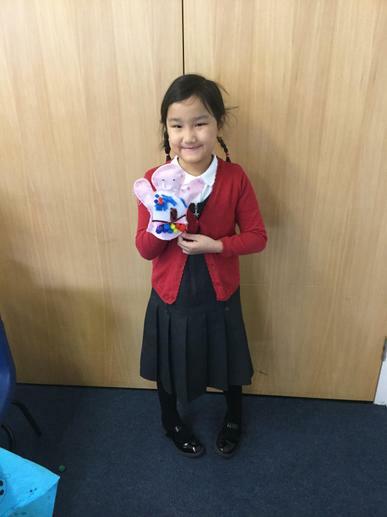 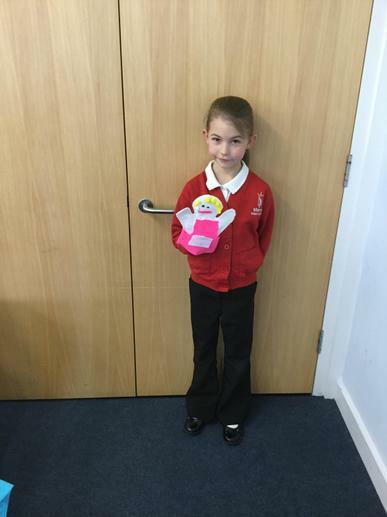 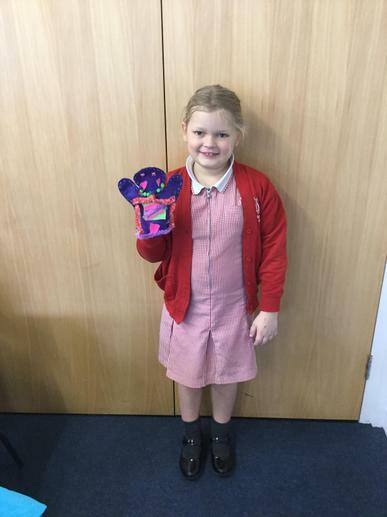 During book week, we designed and created our own puppets based on the characters of Alice and Wonderland. 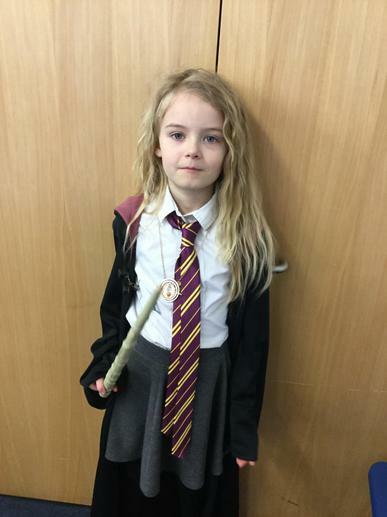 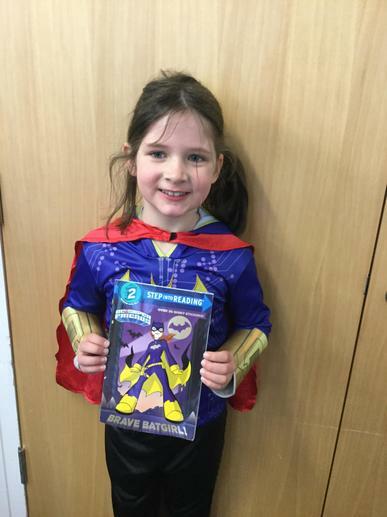 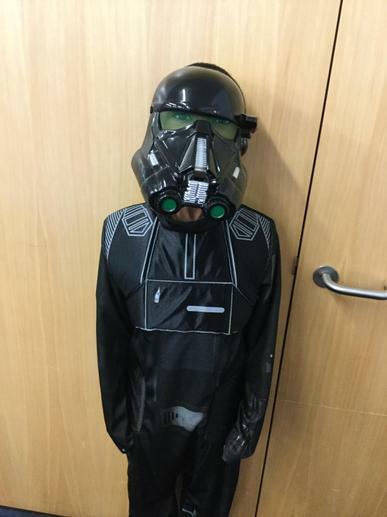 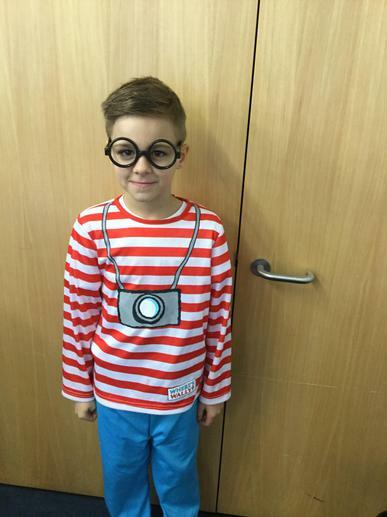 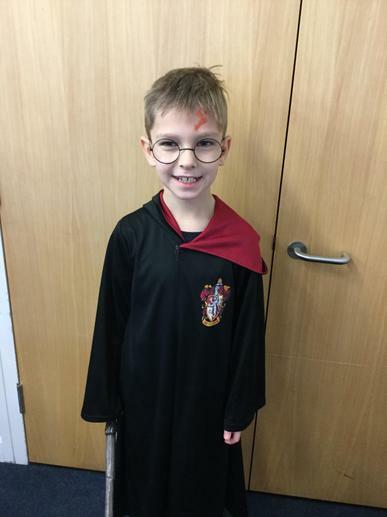 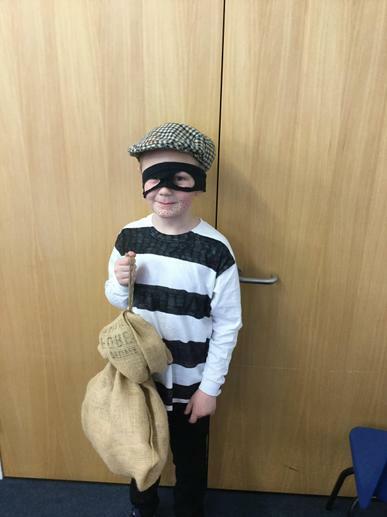 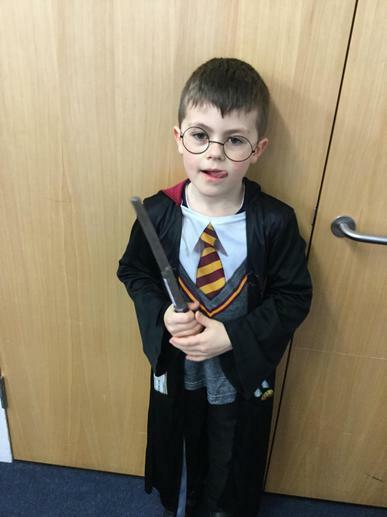 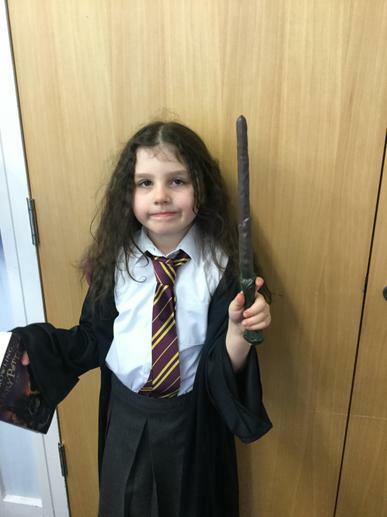 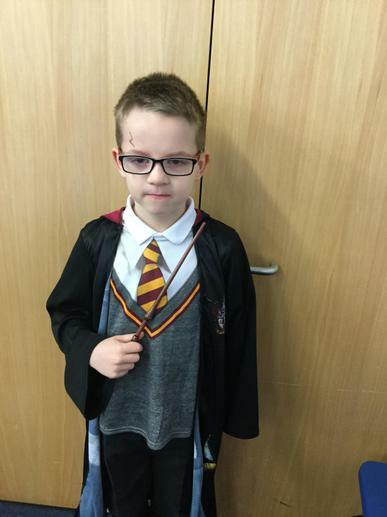 World book day was so much fun! 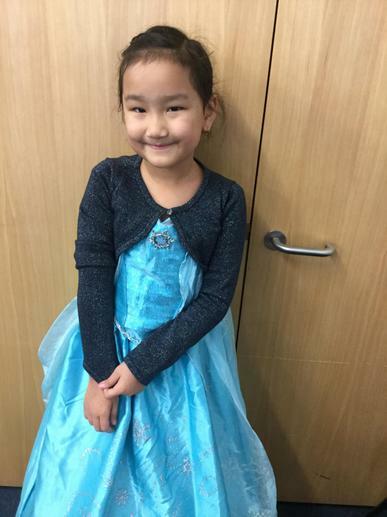 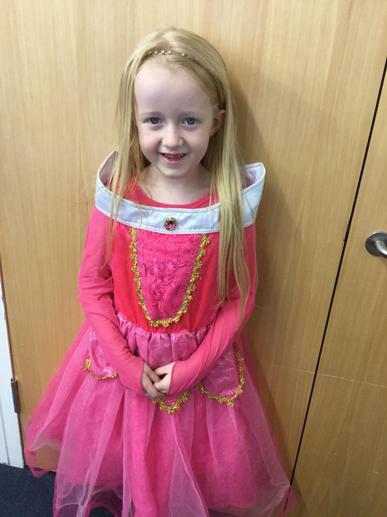 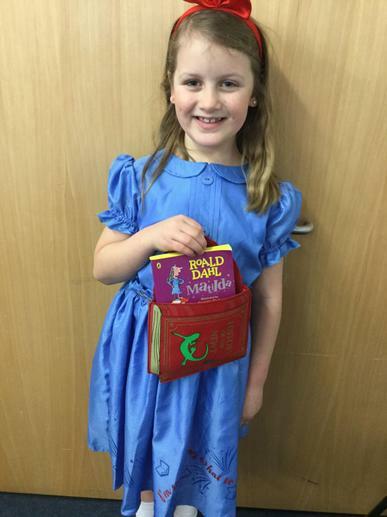 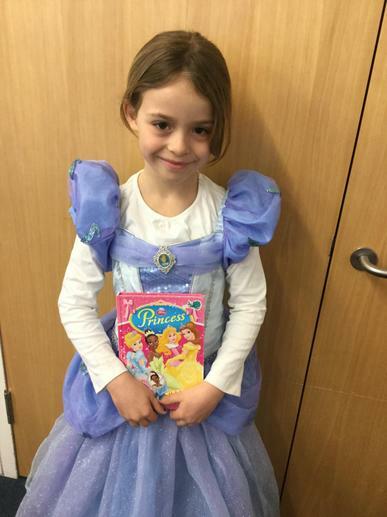 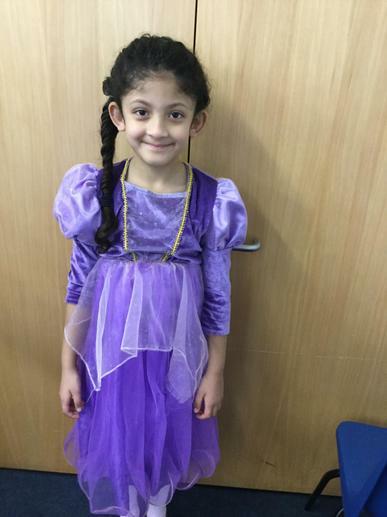 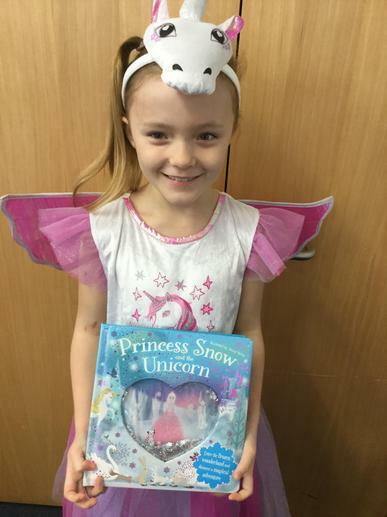 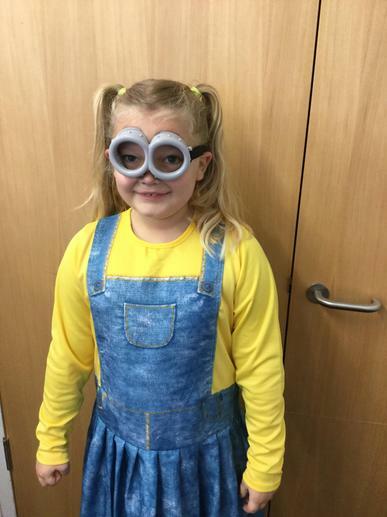 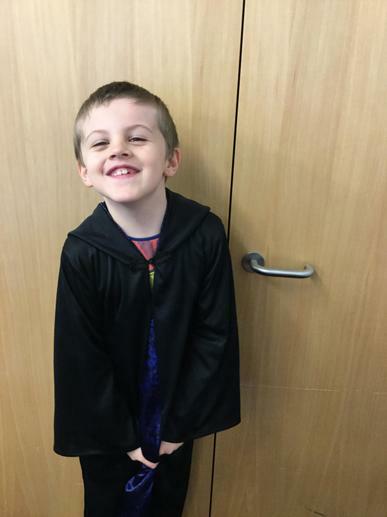 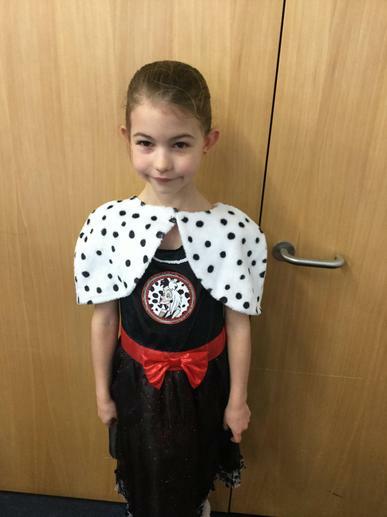 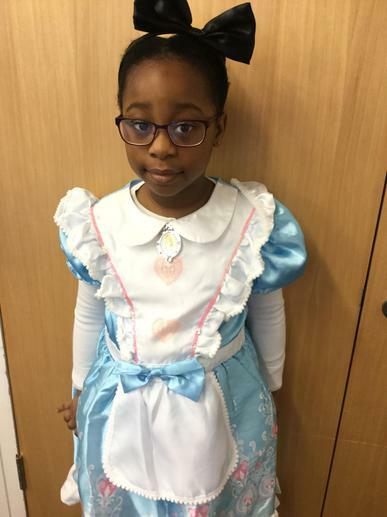 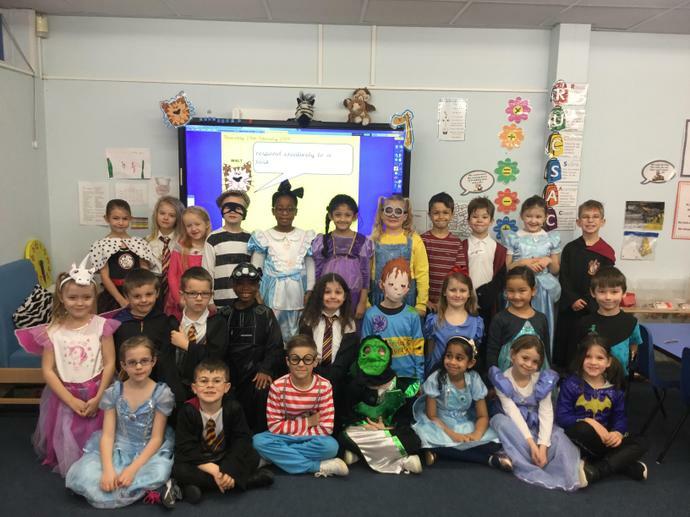 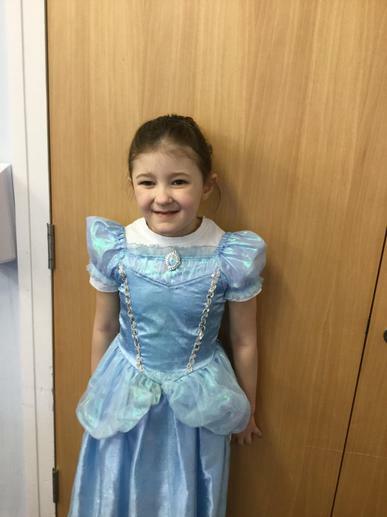 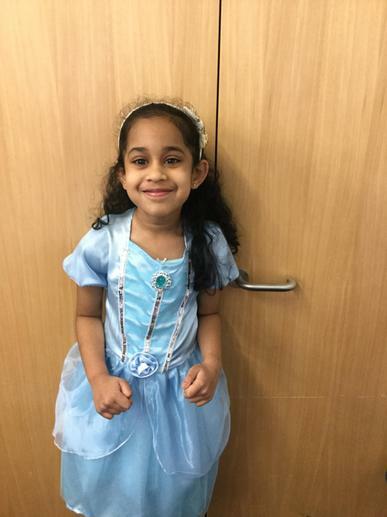 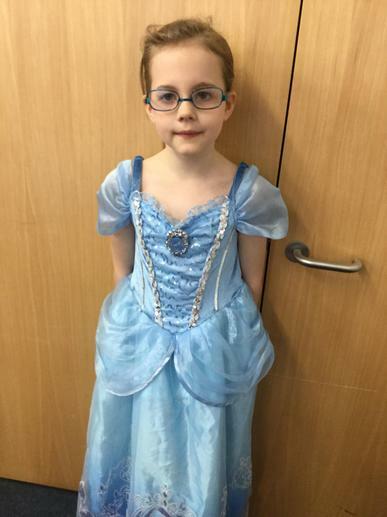 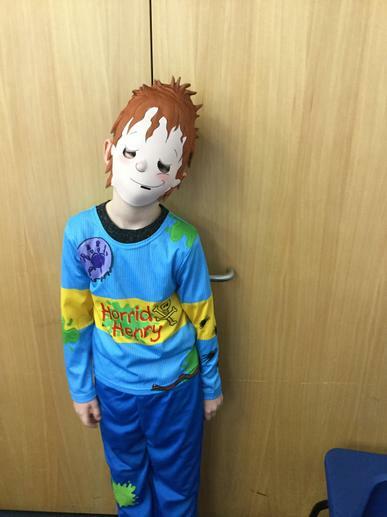 We all came in to school in the most amazing costumes of our favourite story book characters. 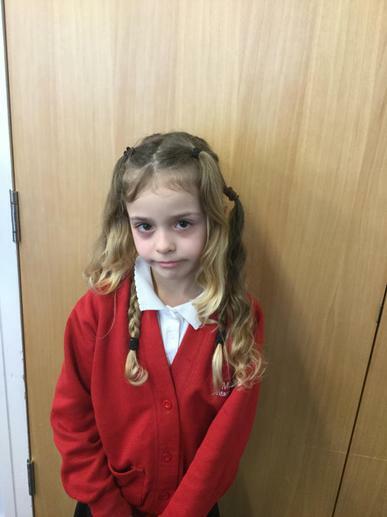 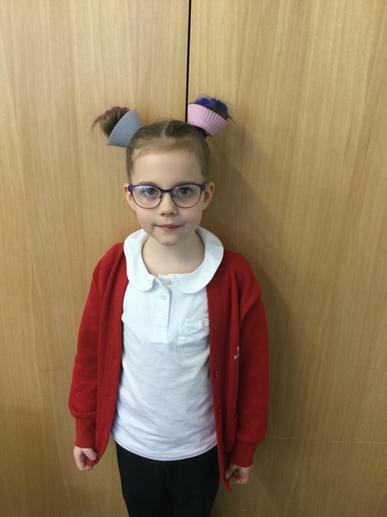 Today was Mad Hair Day! 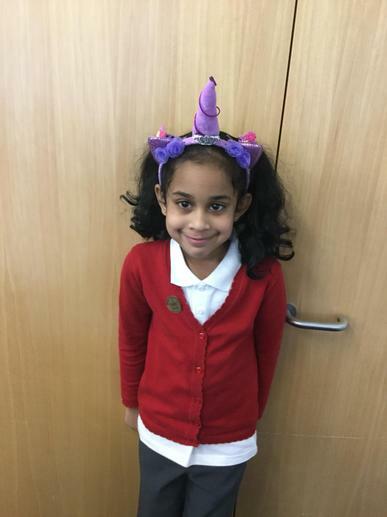 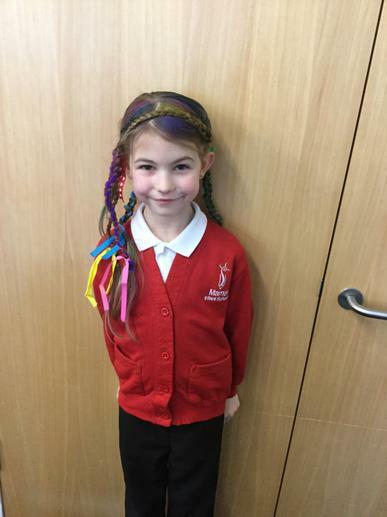 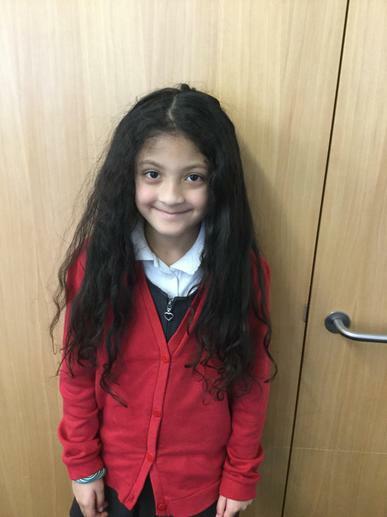 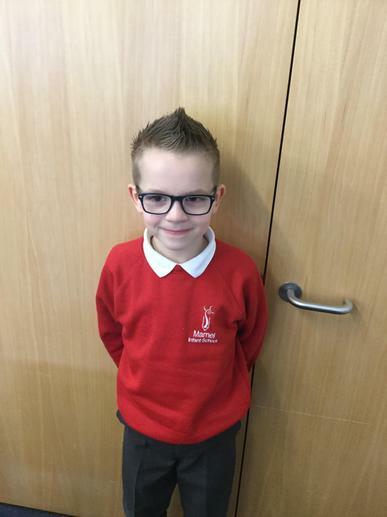 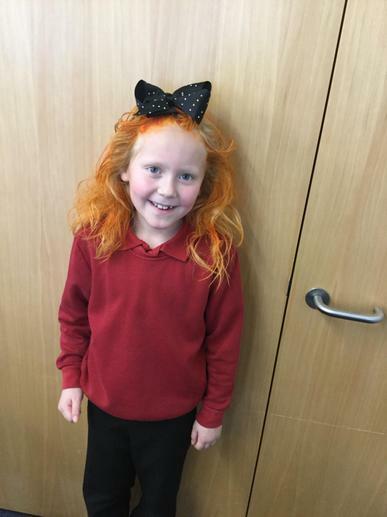 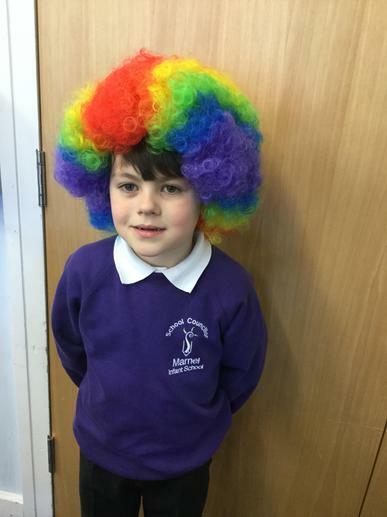 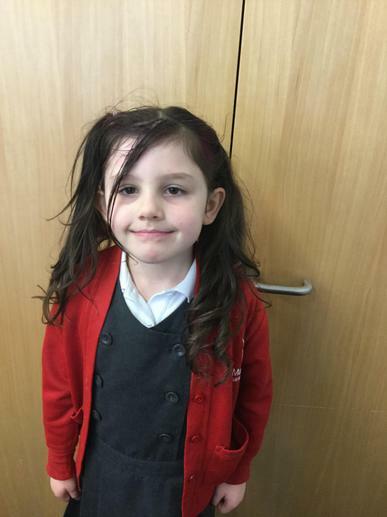 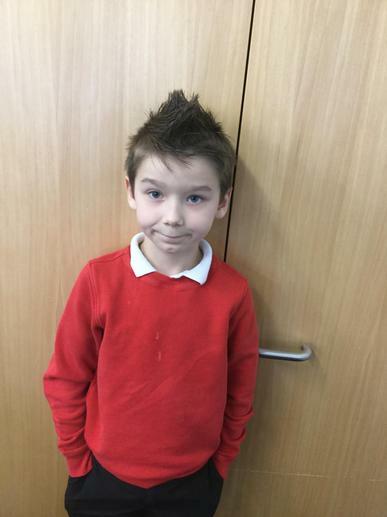 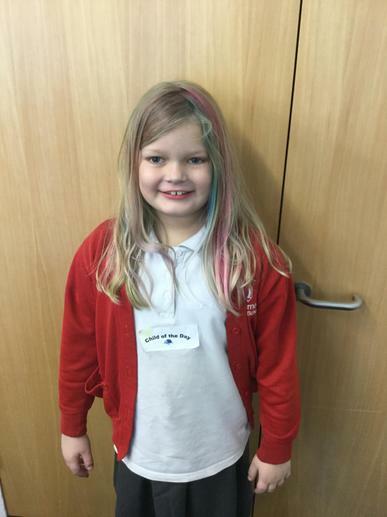 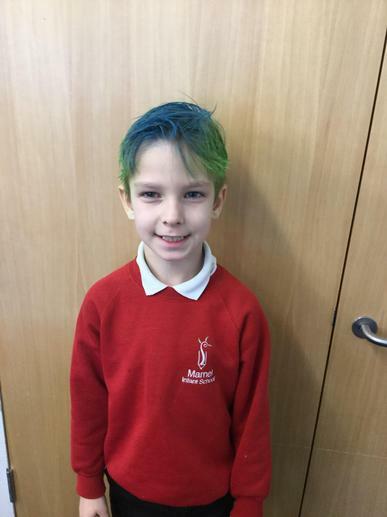 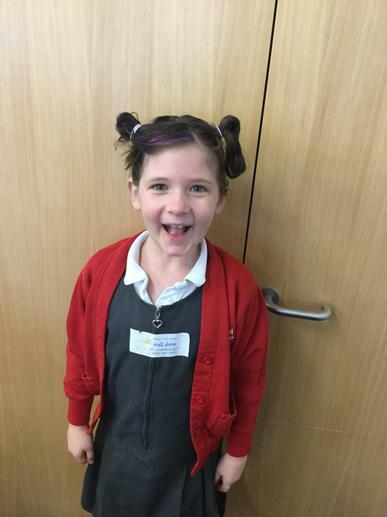 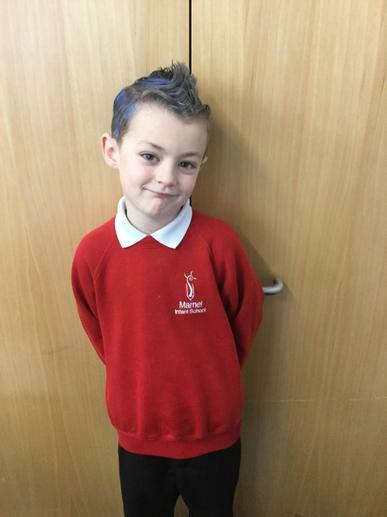 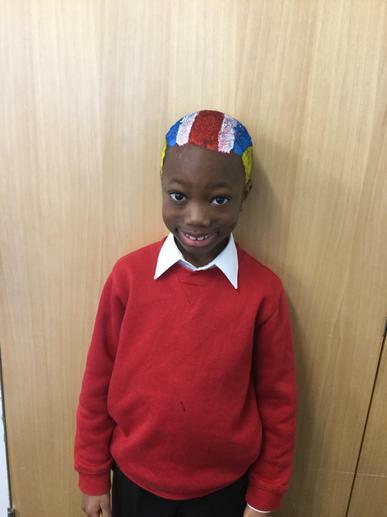 We raised lots of money for St Michael's Hospice and had loads of fun with our mad hair. 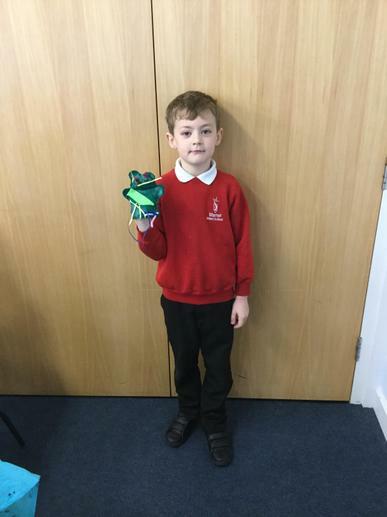 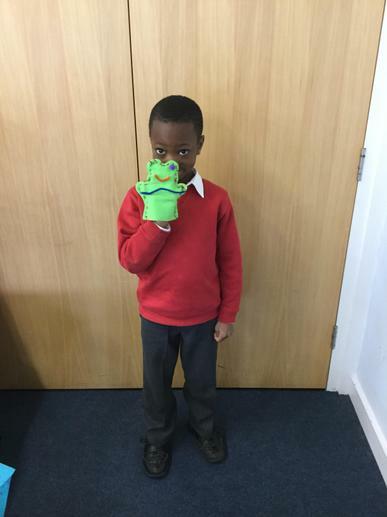 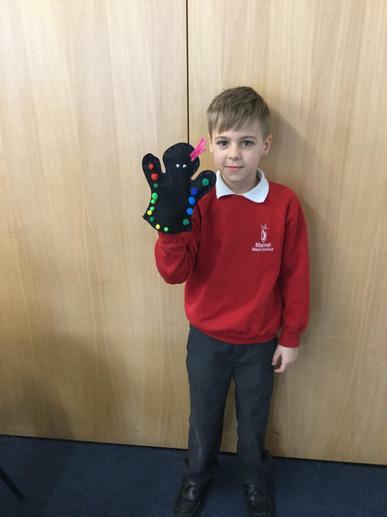 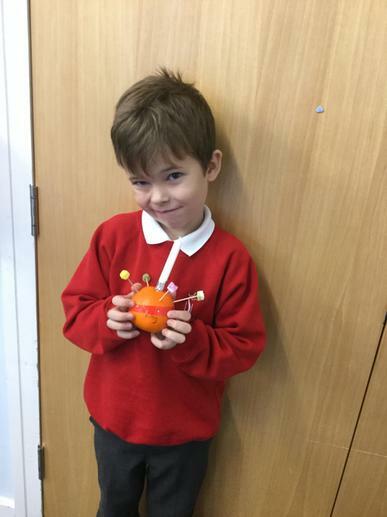 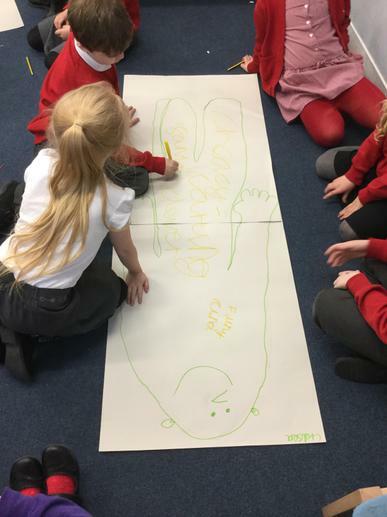 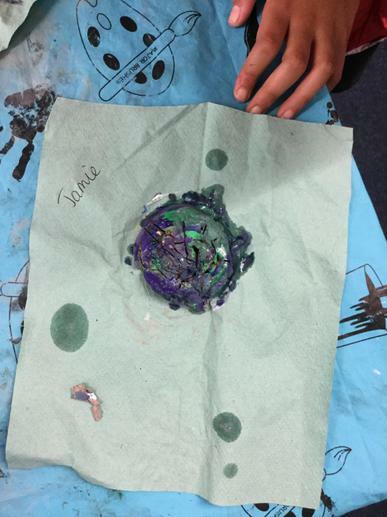 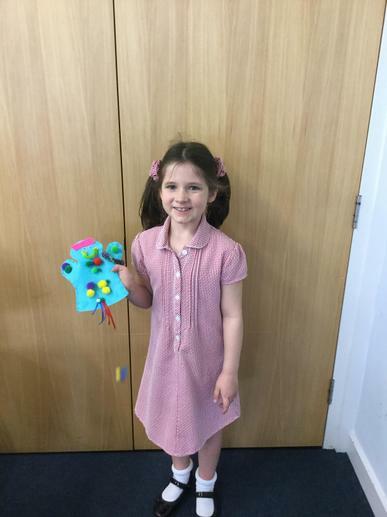 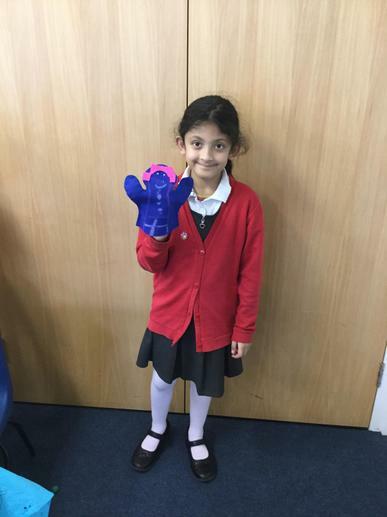 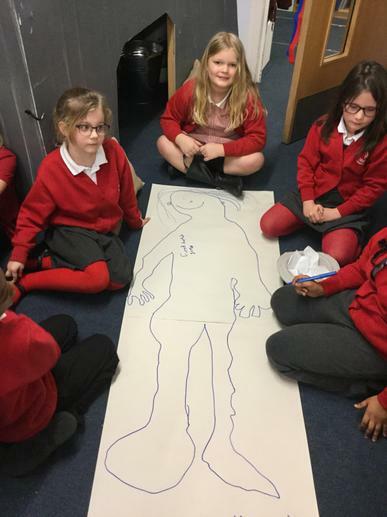 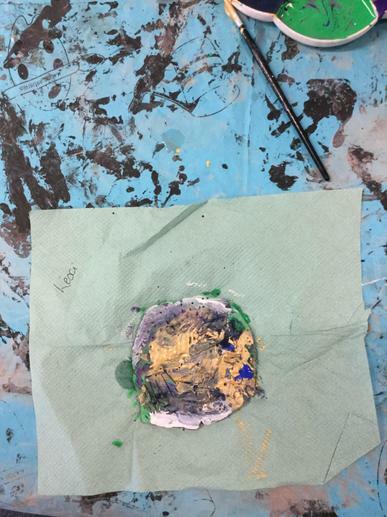 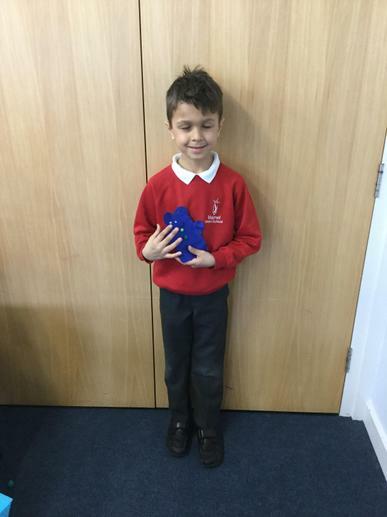 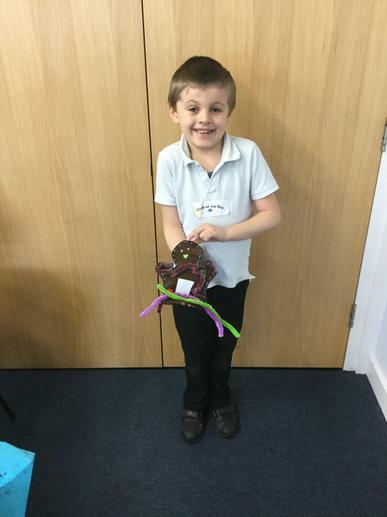 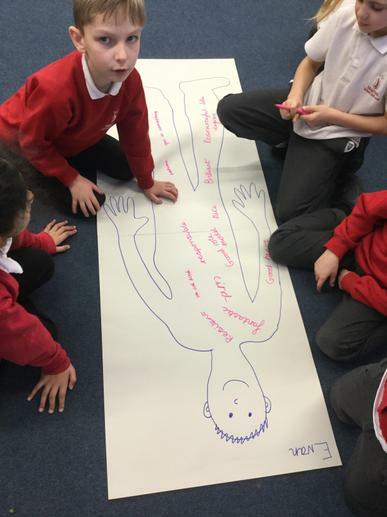 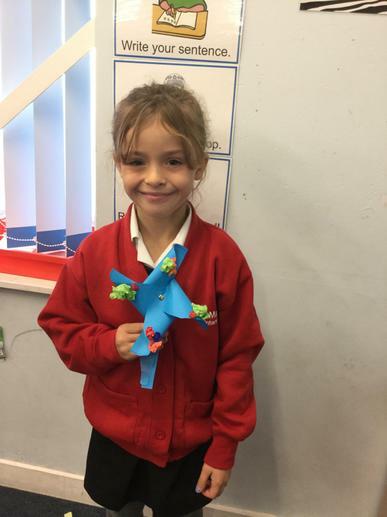 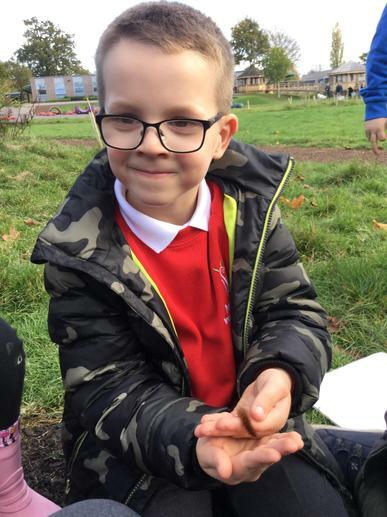 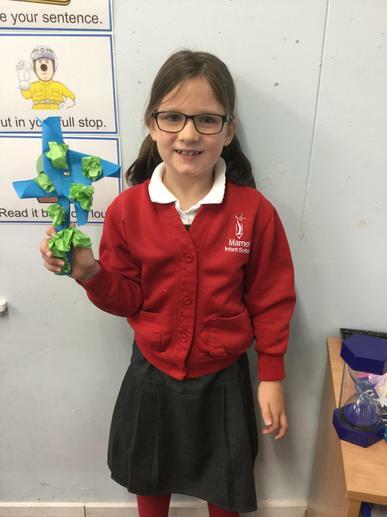 In science we learnt all about how germs spread! 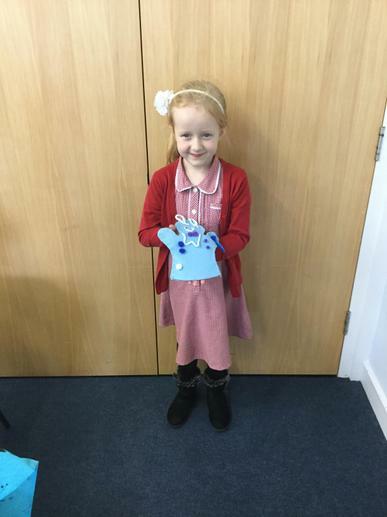 Miss Wheeler put paint on her hand to represent germs and we shook hands down a line to show how germs can spread. 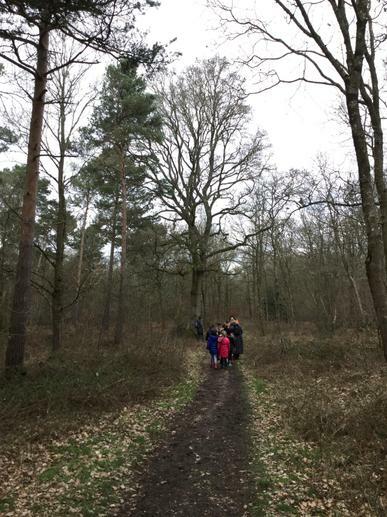 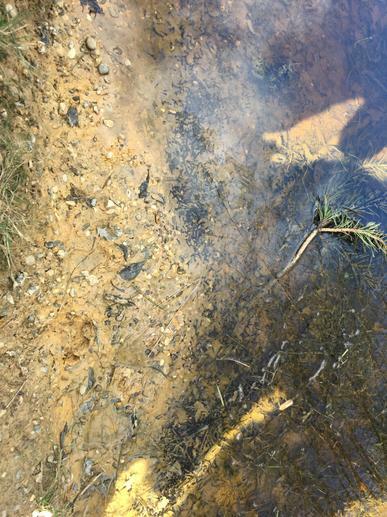 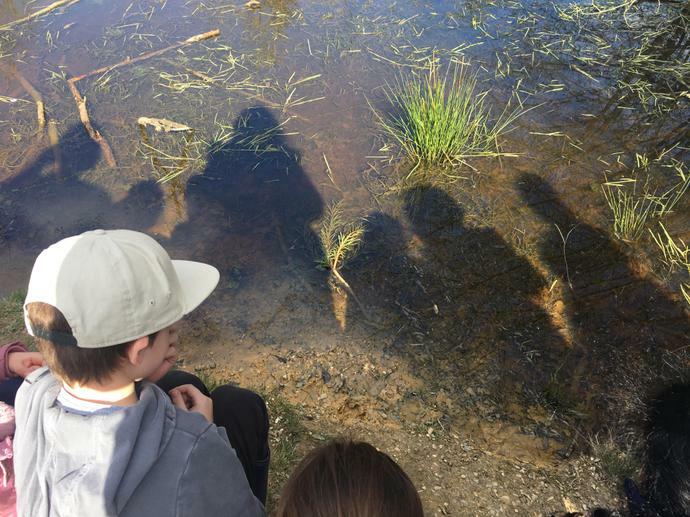 We went on a wonderful trip to the woods. 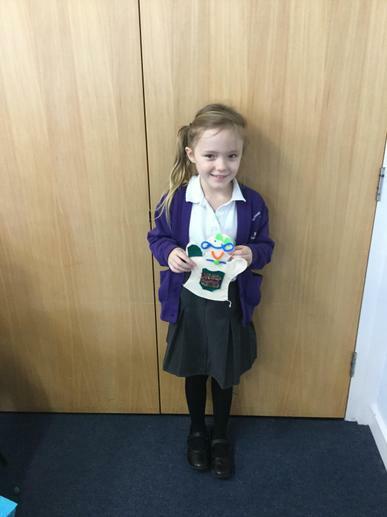 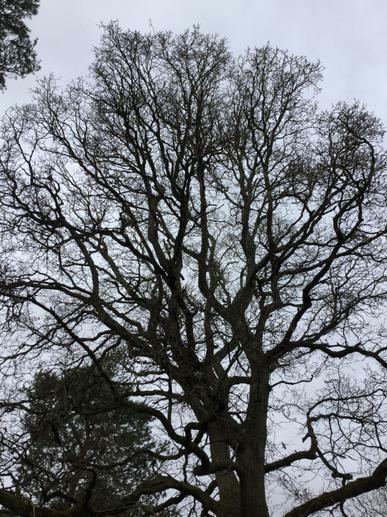 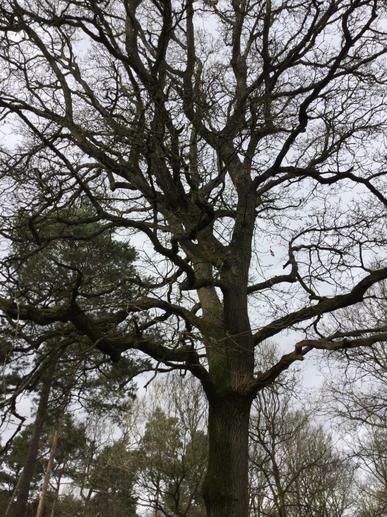 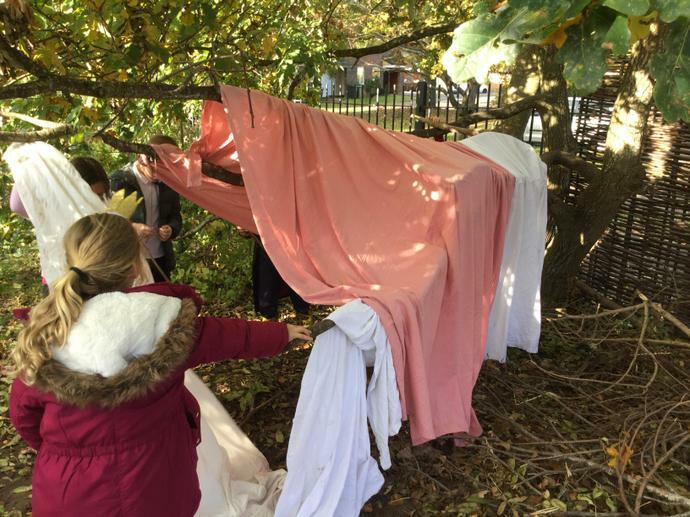 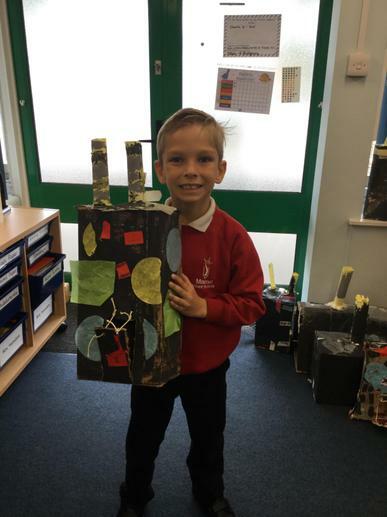 We got to visit our class tree Oakley, it was a brilliant afternoon. 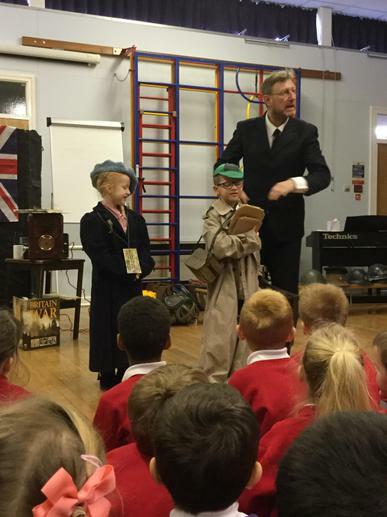 We were very lucky to have someone come in and tell us all about what it was like in WW2 when they were evacuated. 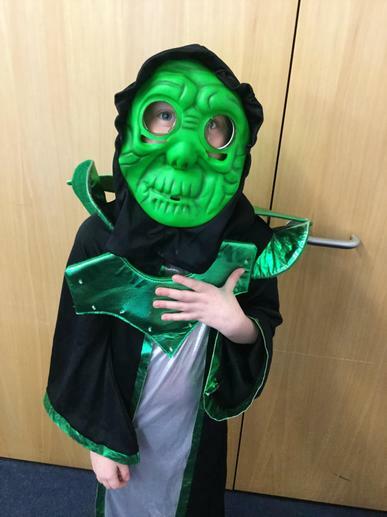 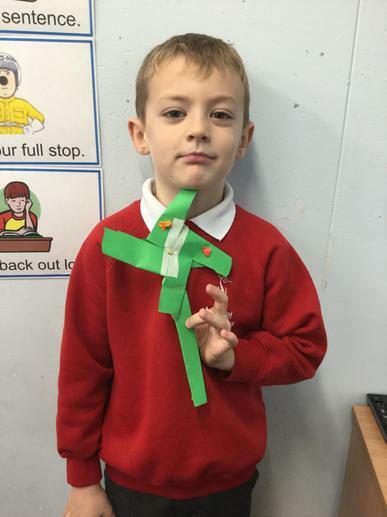 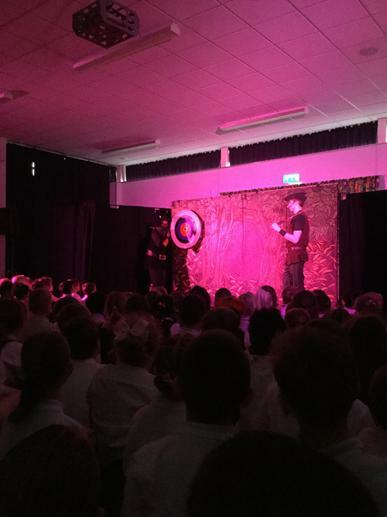 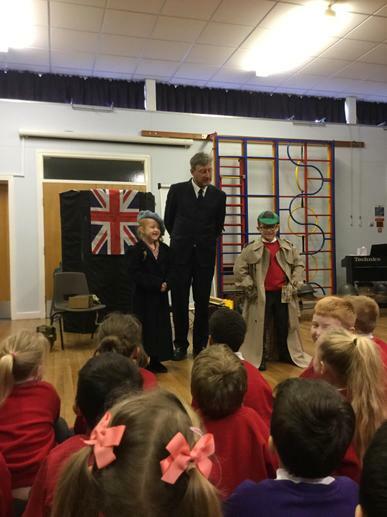 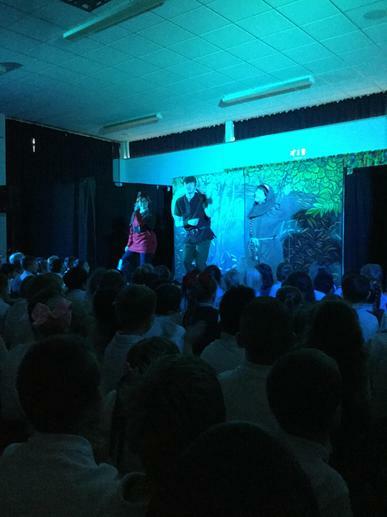 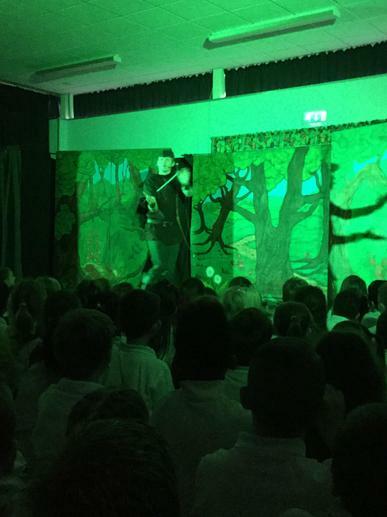 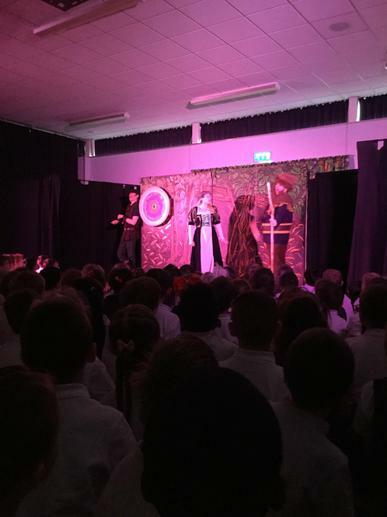 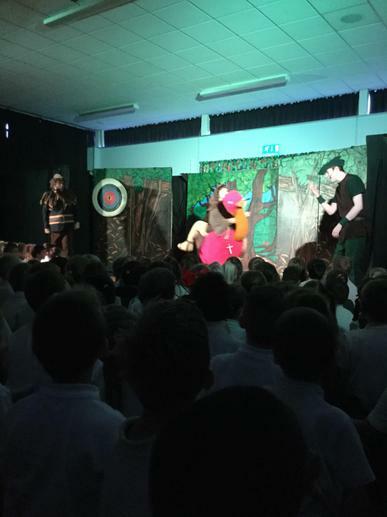 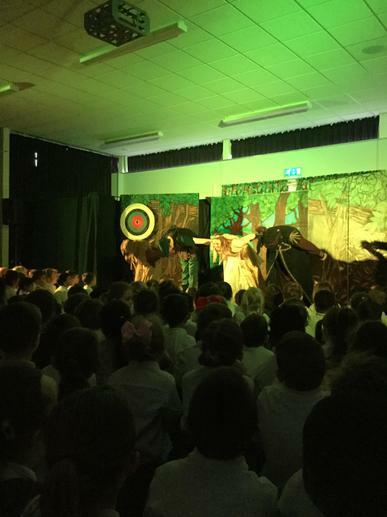 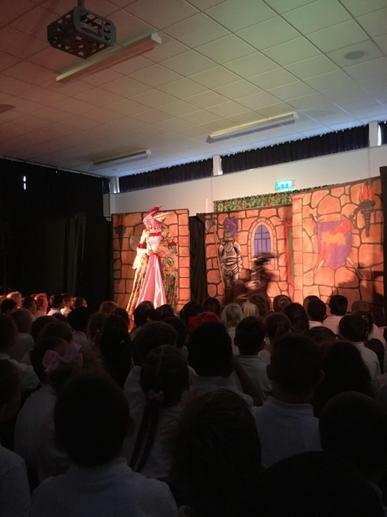 We came back to school to an amazing pantomine called Robin Hood! 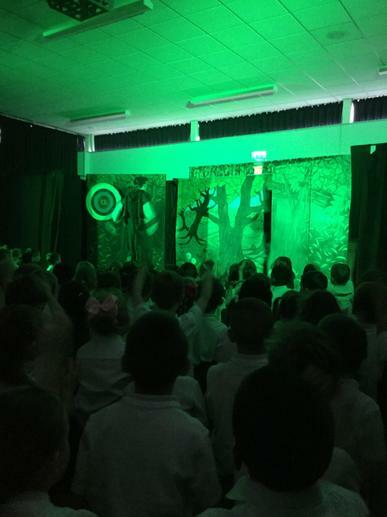 We loved watching the play and created wanted posters to help them find Robin Hood and wrote a recount of the play. 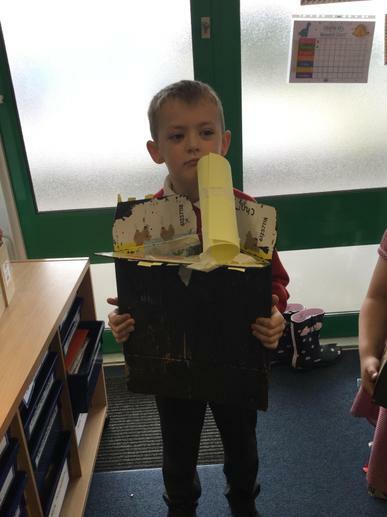 We all starred in our nativity The Sleepy Shepard, We were the main characters in the play and we all worked really hard to put on an amazing show! 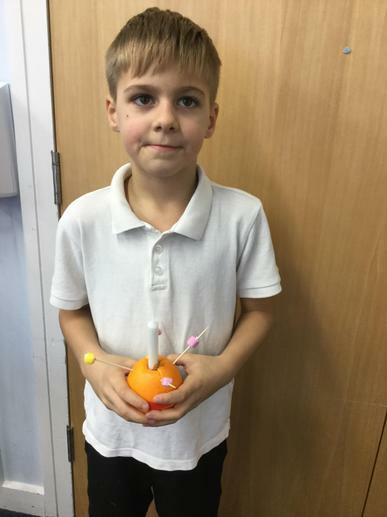 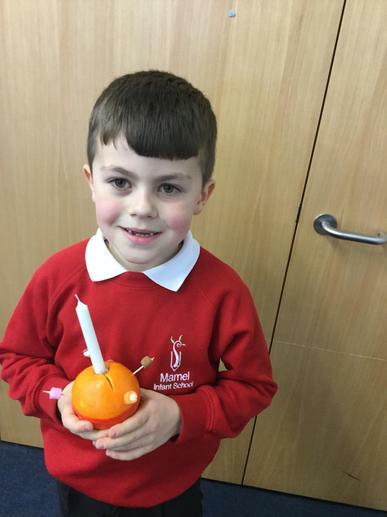 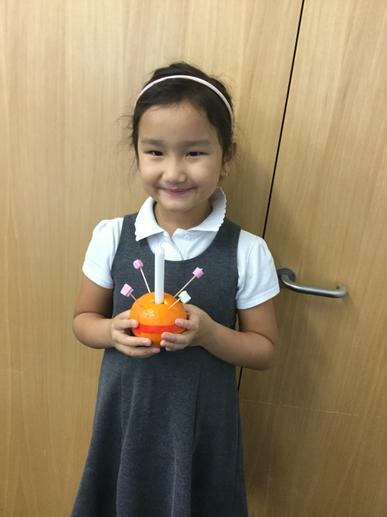 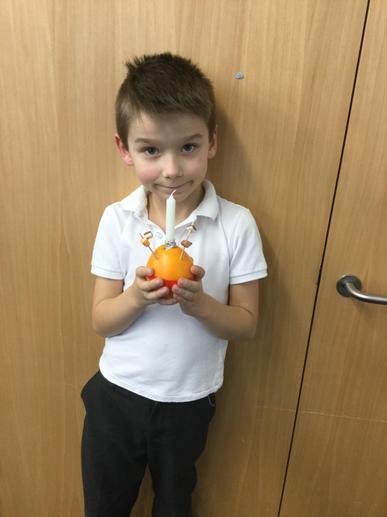 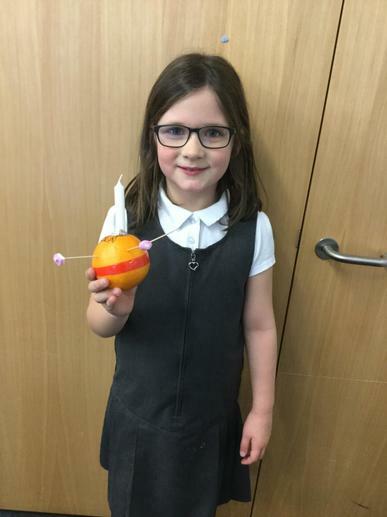 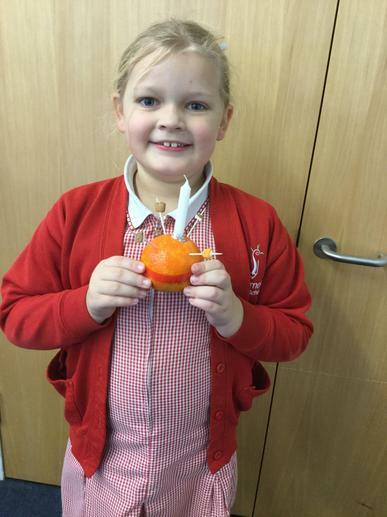 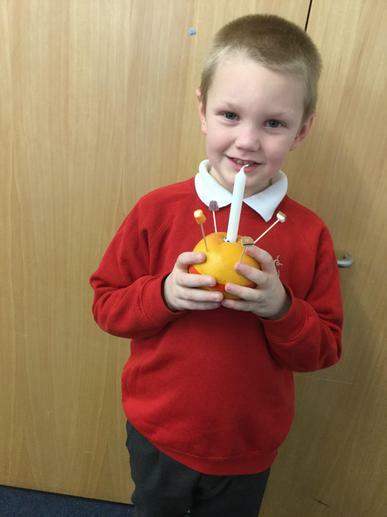 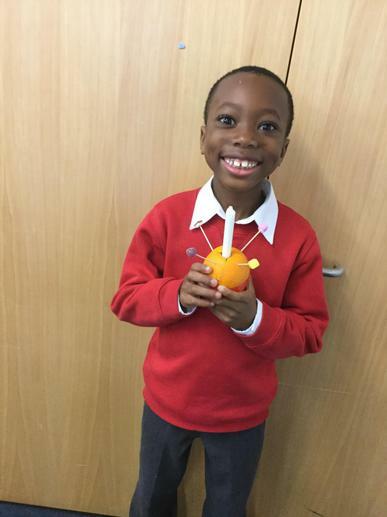 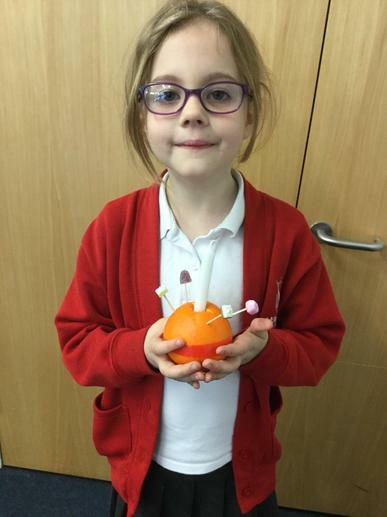 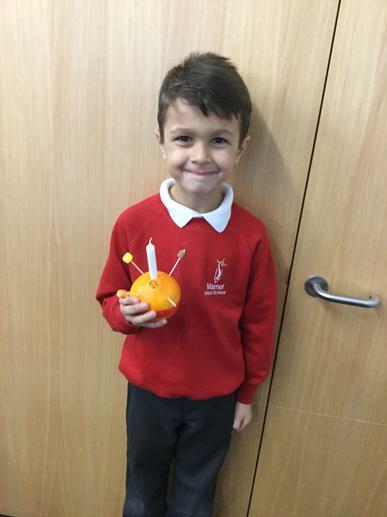 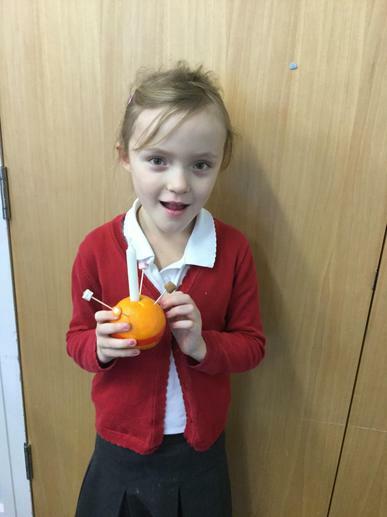 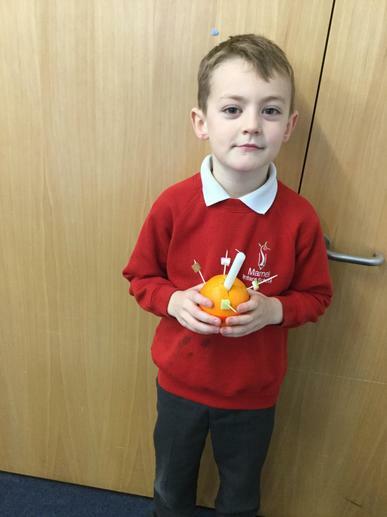 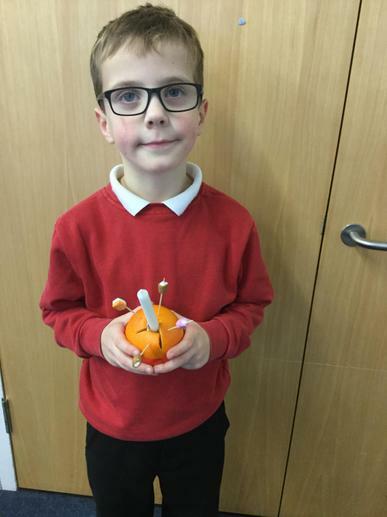 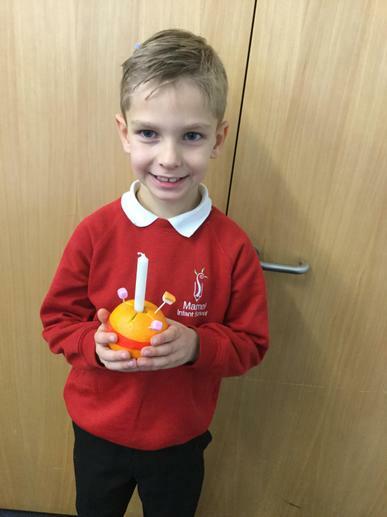 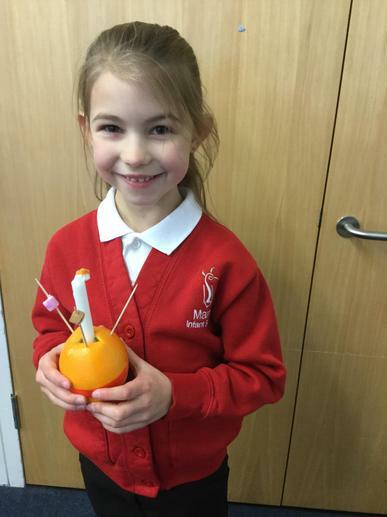 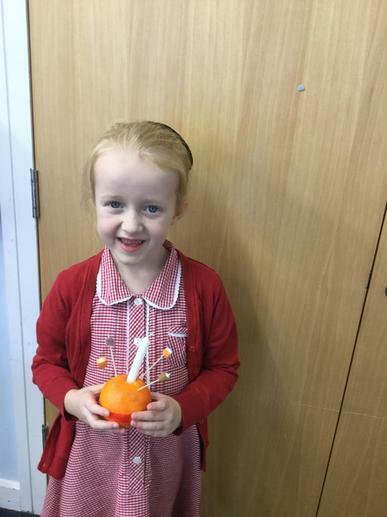 We made our very own Christingles!! 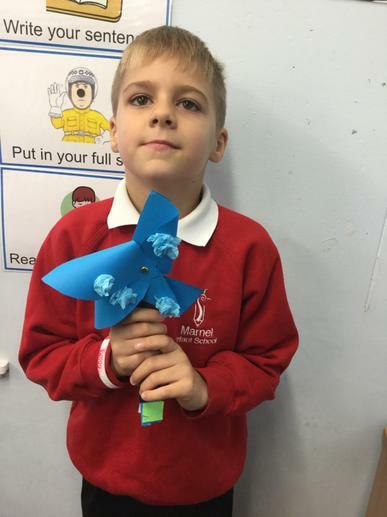 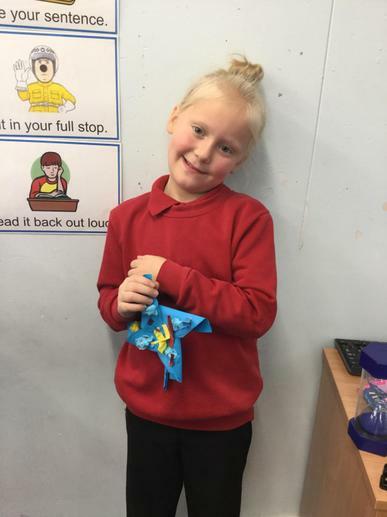 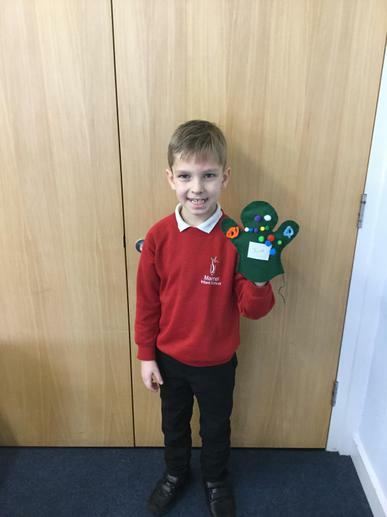 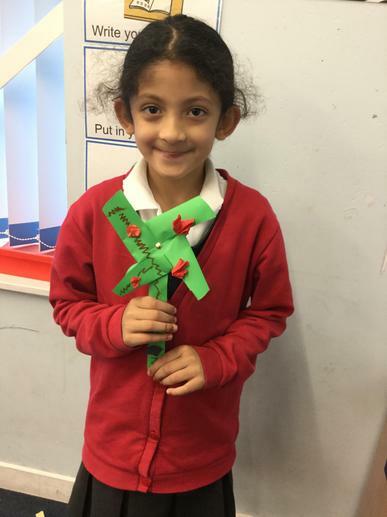 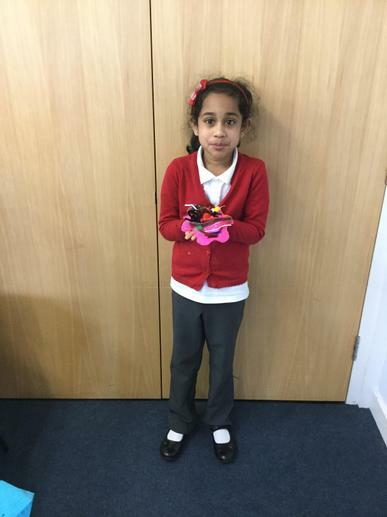 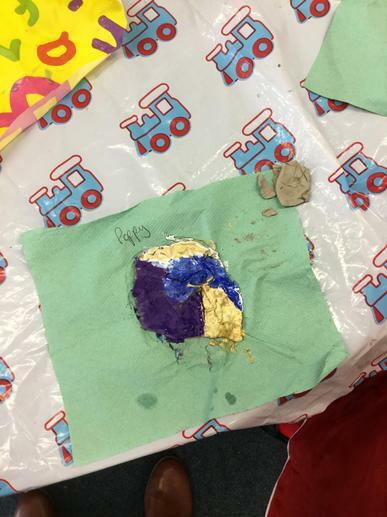 Poppy day: We did lots of Poppy themed activities and created our own clay poppies. 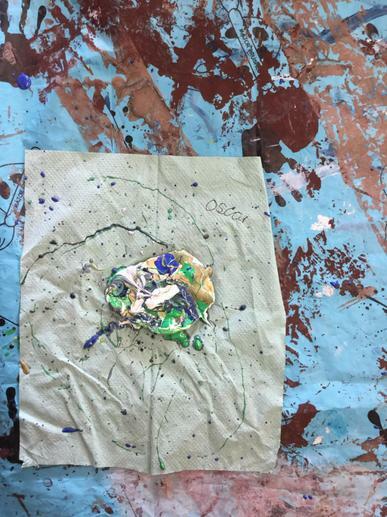 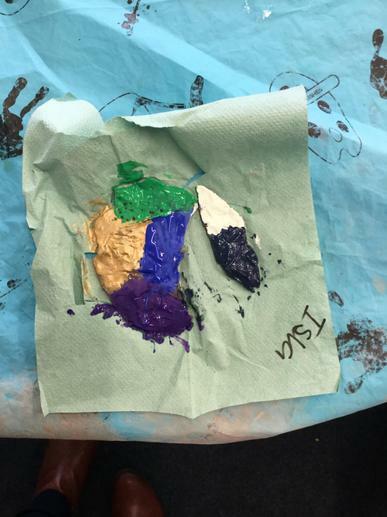 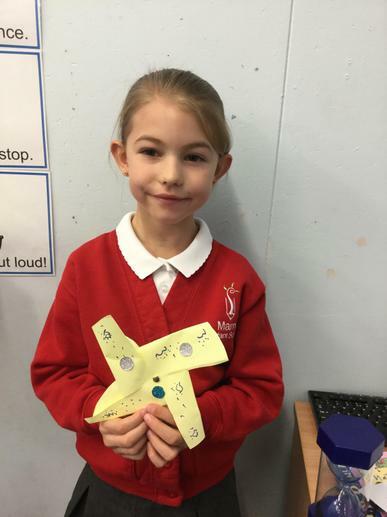 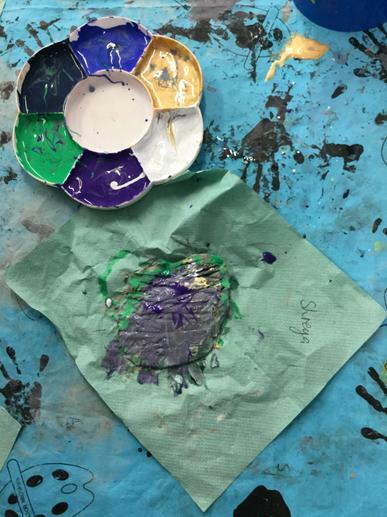 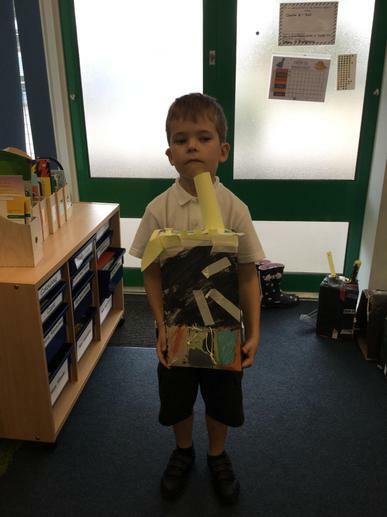 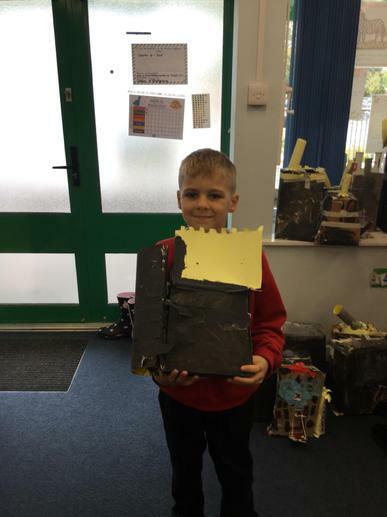 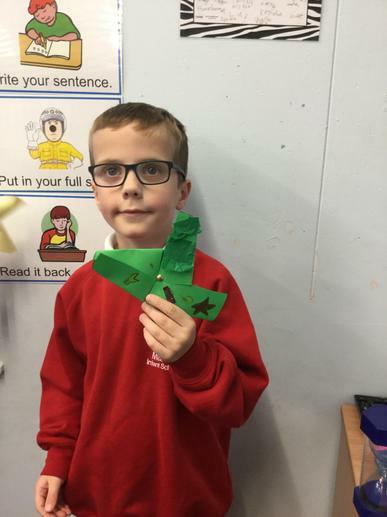 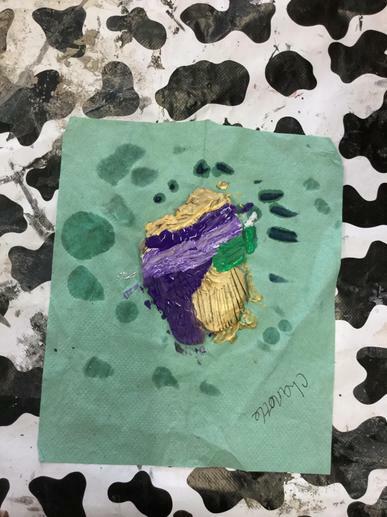 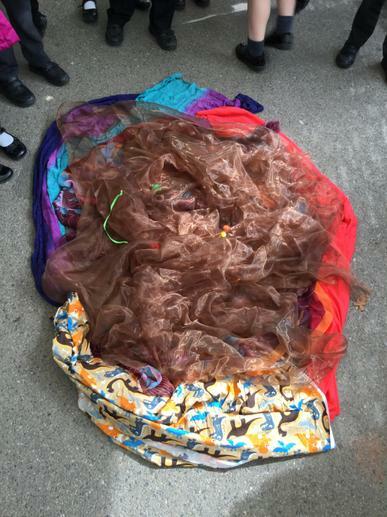 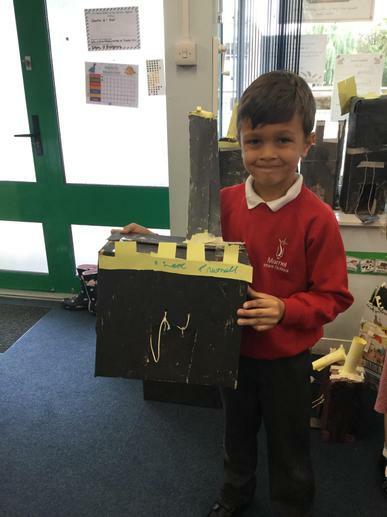 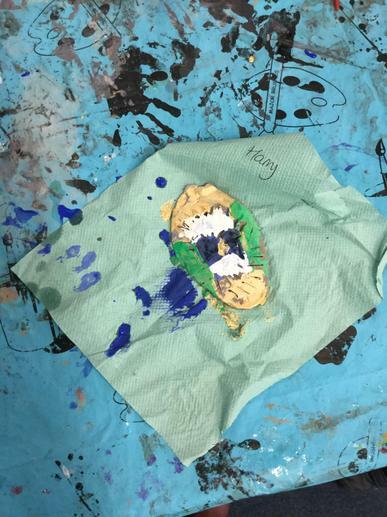 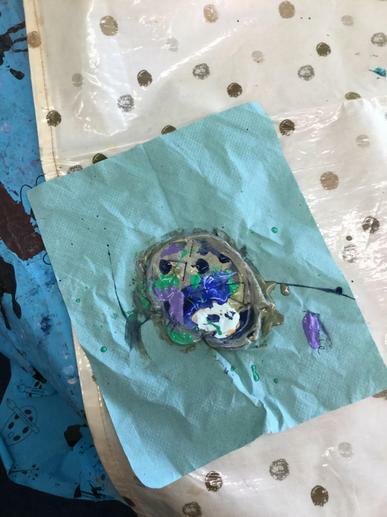 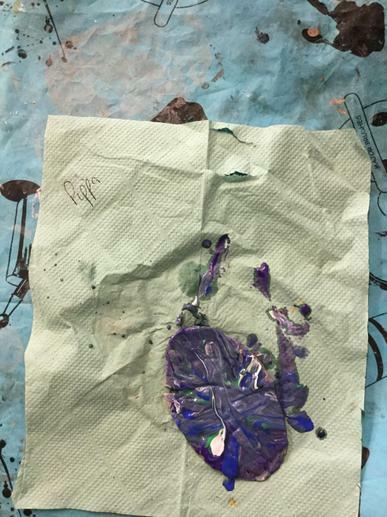 This week has been arts week! 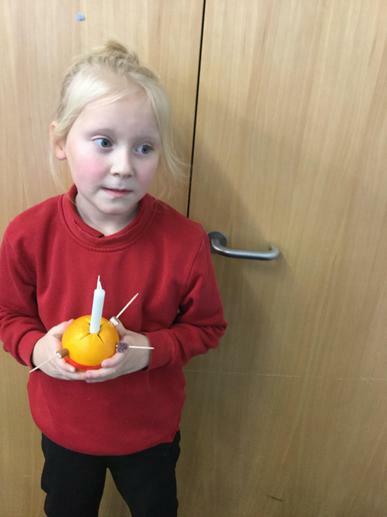 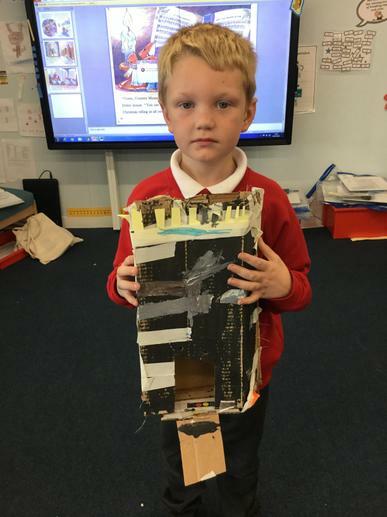 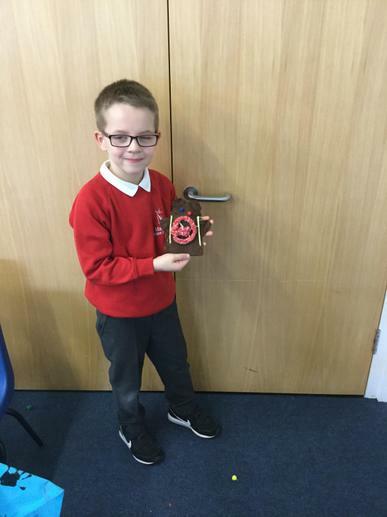 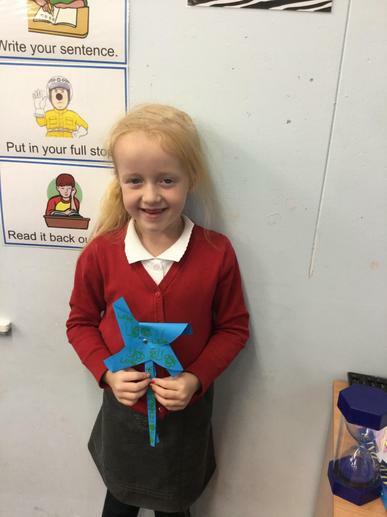 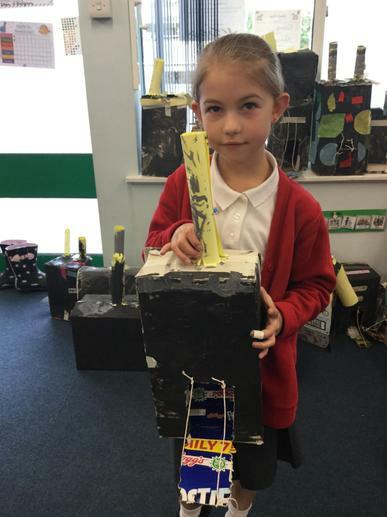 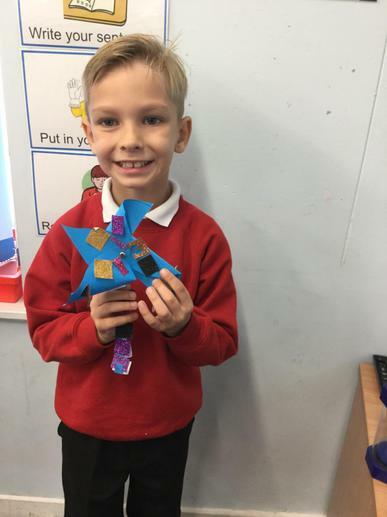 We have taken part in lots of fun activities this week all based around the topic of fireworks night. 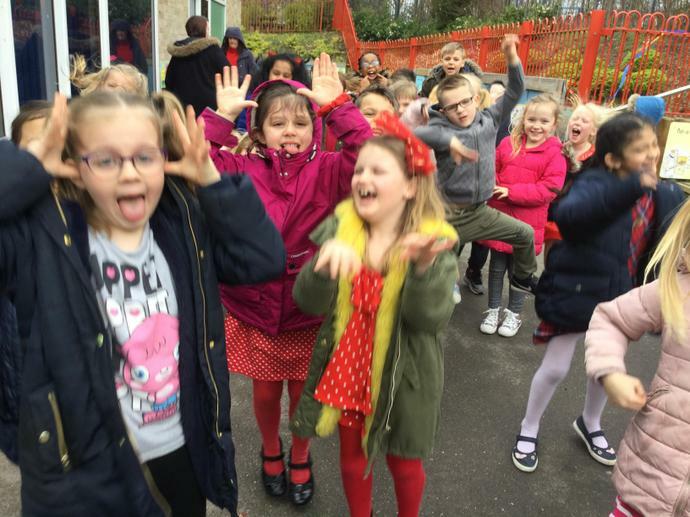 We have all had lots of fun!